Gemstones can be confusing, we must admit – mind numbingly so! With over 130 types of individual jewelry quality gemstones, and a mess of undoubtedly unfamiliar terms, the hunt for picking the ideal stone for your wedding or engagement ring may have left you at a flustered standstill. We find that the easiest way to solve this confusion is by compiling all the gemstones and putting them in their scientific groups, ones determined by their Mohs hardness rating and their chemical composition. Does that sound like a headache in and of itself? Absolutely! Lucky for you we did the hard work for you, now all you have to do is pick! Beryl minerals are ones that are chemically composed of Beryllium Aluminum and have a Mohs Hardness Rating that ranges between 7.5 and 8. This versatile mineral is one of the most popular minerals for the use of jewelry, not surprising considering it’s durability and extensive variety of color and translucence. Aquamarine is a beautiful light blue Beryl and, perhaps, one of the most popular in this group! Bixbite is an elegant red, that more commonly can be identified as maroon, Beryl that is as stunning as it is timeless. 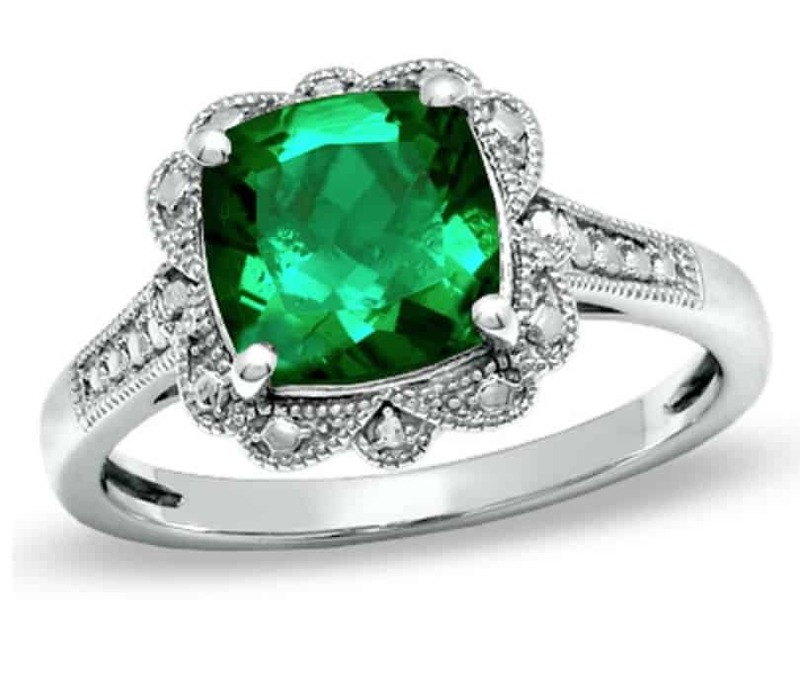 Emerald is an impressive forest green gemstone and the most popular Beryl. Goshenite is a mesmerizing colorless gemstone whose impressive luster and clarity have given it the title “mother of gemstones”. Green Beryl is a mesmerizing light green Beryl that comes in beautiful shades of mint green. 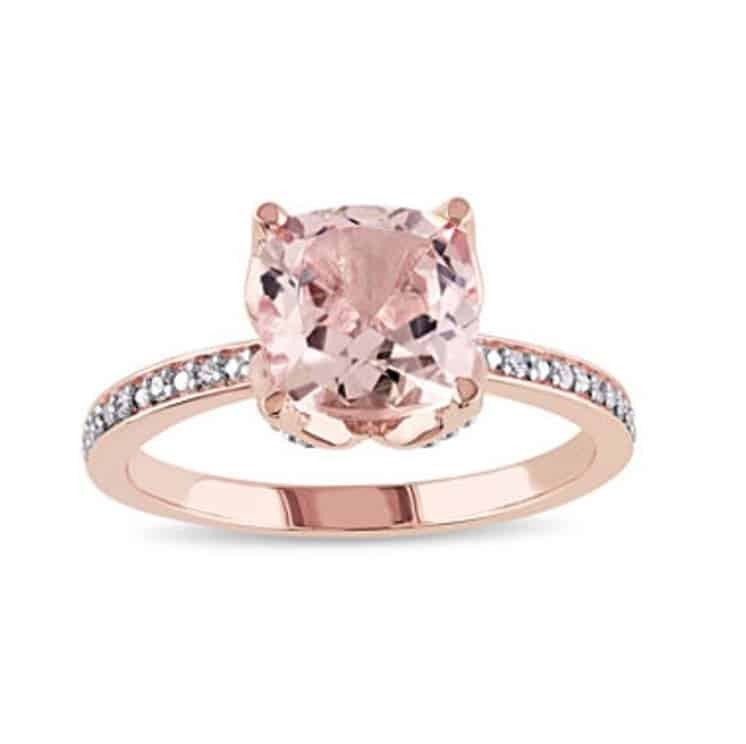 Morganite is a delicately colored peach-pink Beryl and is often praised for it’s airy and feminine color. 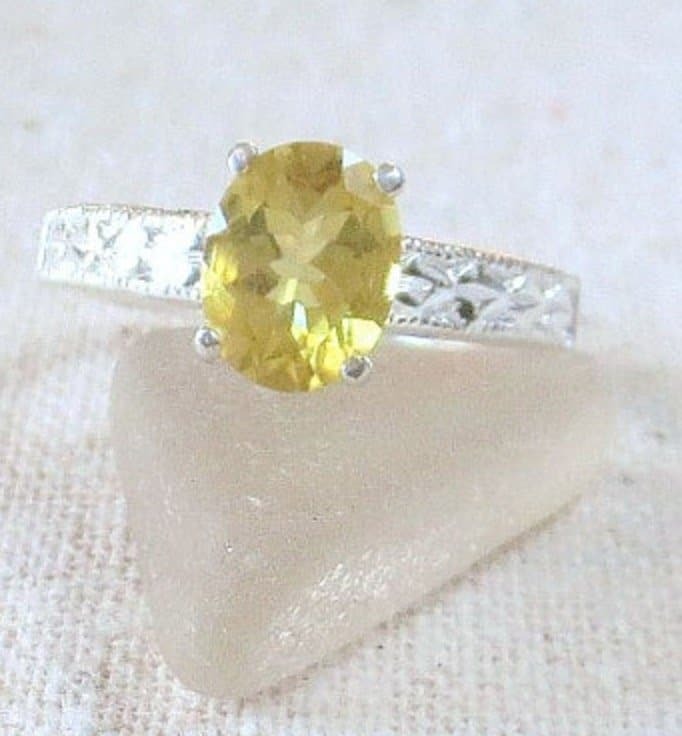 Heliodor comes in shades that transcend from gold to a neon-like green and make incredibly unique center stones for wedding and engagement bands. Chrysoberyl is a Aluminum Oxide Beryllium and close relative of the Beryl family. 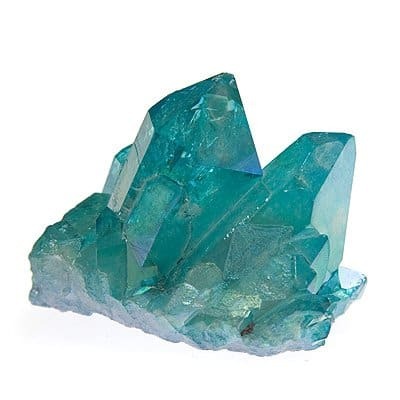 This tough and durable mineral has a Mohs Hardness Rating of 8.5, making it stronger than Beryl, but is also less lustrous and brilliant than its Beryl counterpart. 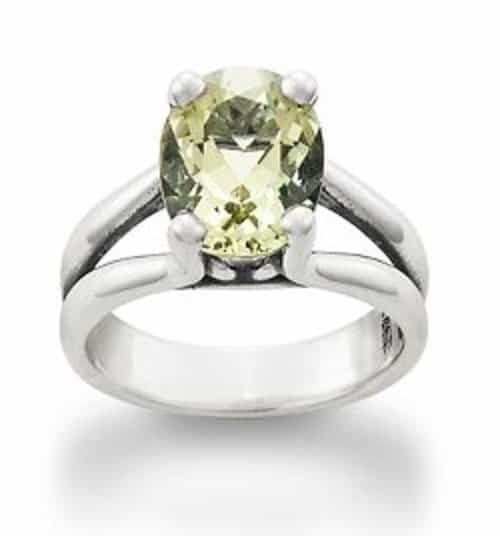 Chrysoberyl is available in more earthy colors such as greens, yellows and oranges, making it a great option for the organic bride or groom and a stunning option for a wooden wedding band inlay. 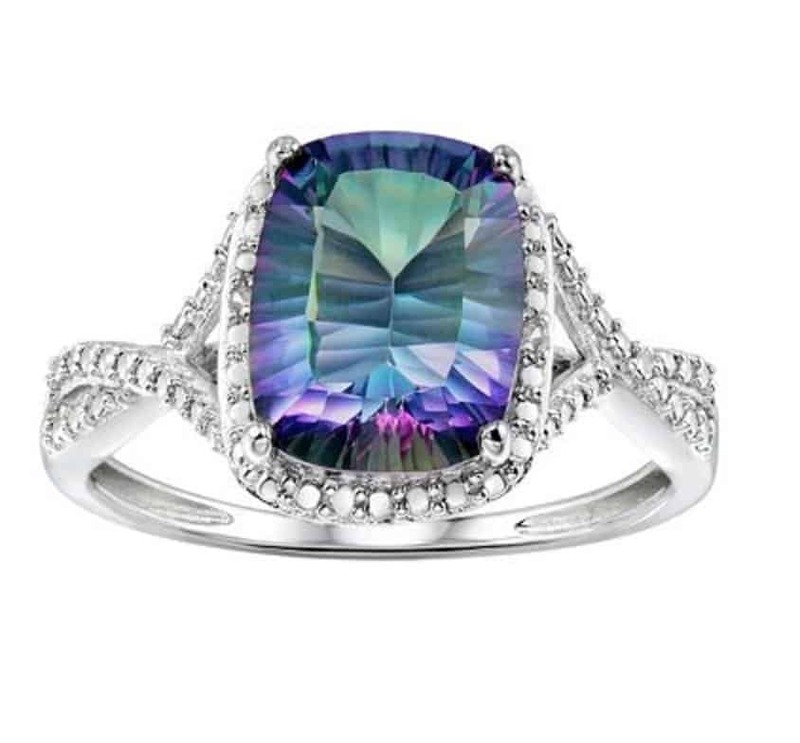 Alexandrite is a chrysoberyl variety popular for it’s color changing characteristics and typically shifts between dark shades of purple and green. Corundum is an Aluminum Oxide that has an impressive 9 on the Mohs Hardness Scale, making it the hardest mineral known to mankind, second only to diamonds. Corundum is a rock forming mineral, meaning it forms within the entity of a rock host, and is a relatively common mineral. 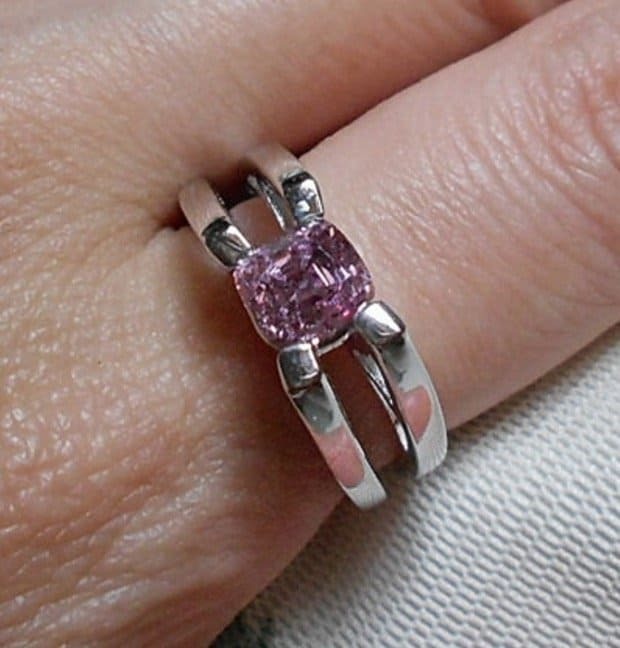 While Corundum is generally recognized as common, however, when of quality that escalade it to the level of gemstones, Corundum is actually quite rare and valuable. 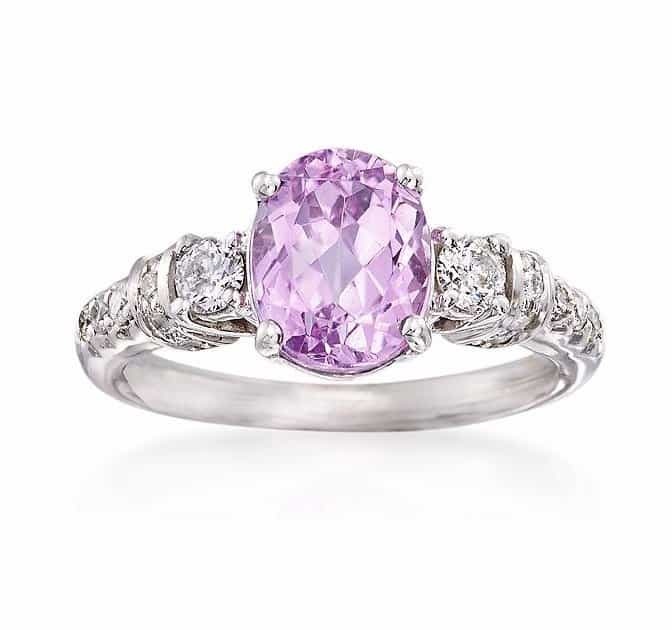 As a group, Corundum finds itself to be the umbrella of several extremely popular gemstones that would make an impressive addition to any engagement or wedding band. 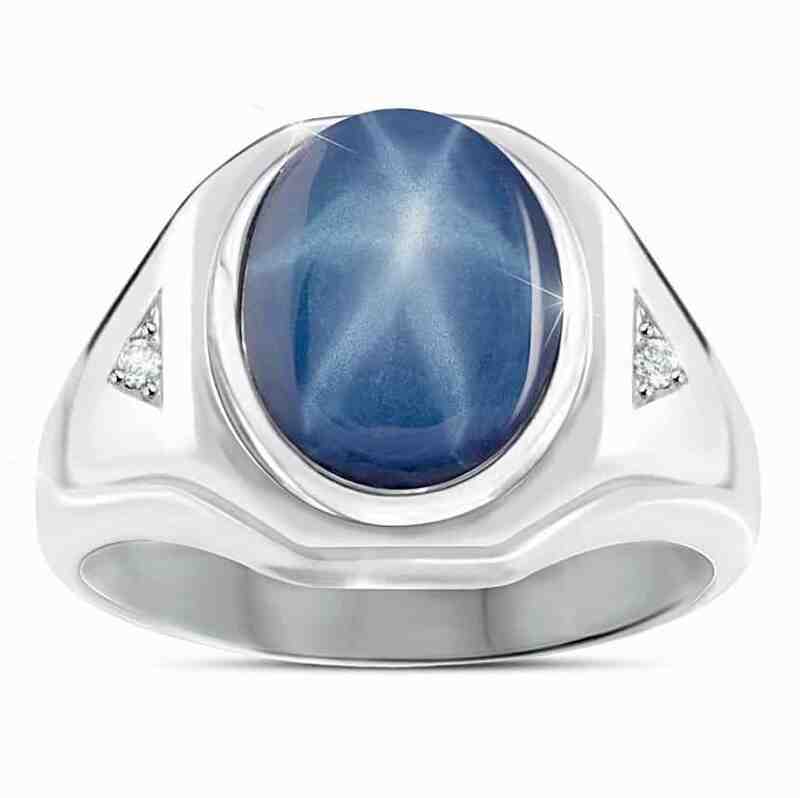 Sapphire is a Corundum mineral most popular for its deep, ocean-like, blue coloring. 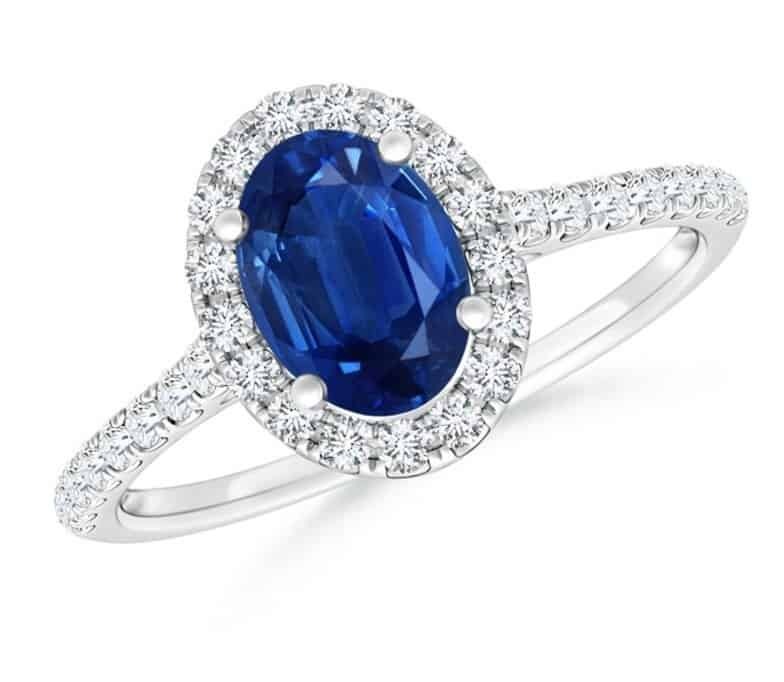 Though most known for its blue coloring, sapphire can also be found in an array of different shades, these Corundum’s are known as fancy sapphires. 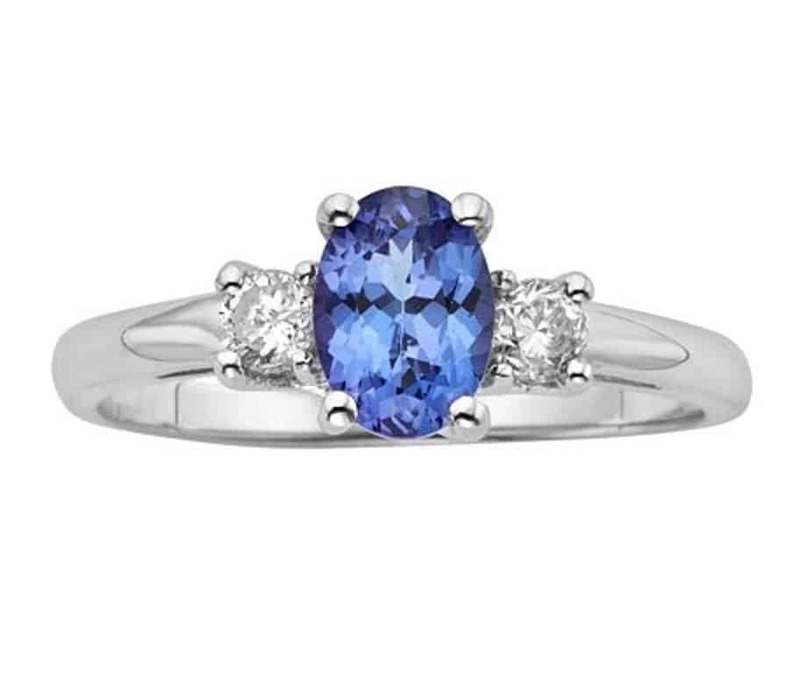 Color Changing Sapphires are a form of fancy sapphires that hold an innate ability to change overall color dependent solely on the light source under which its viewed. Star Sapphires are Sapphires that possess inclusions that create the shadow like illusion of a star within the stones interior. 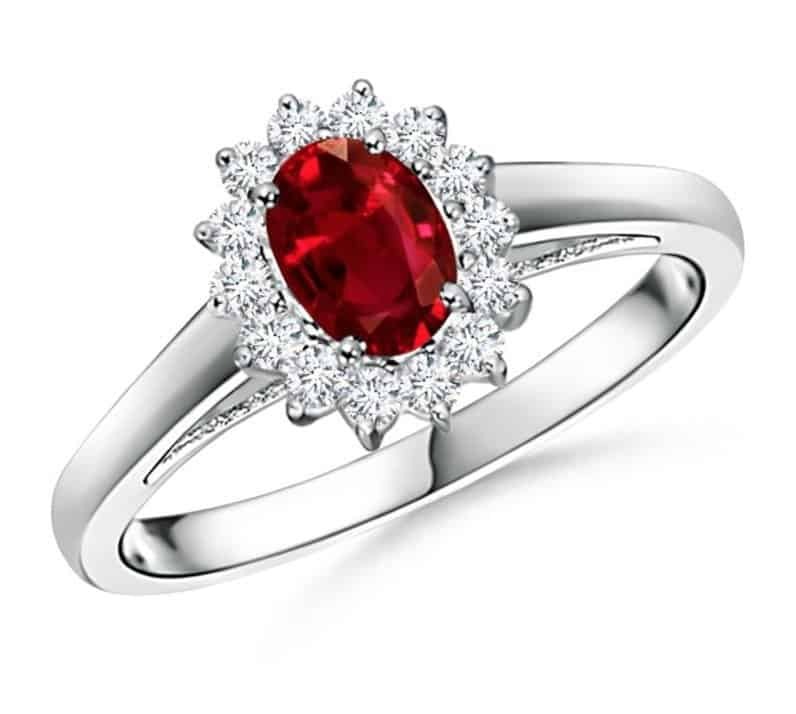 Ruby is the name for bright red Corundum. Rubies carry one of the highest price tags associated with colored gemstones and are highly sought after for magnificent wedding and engagement rings. Star Rubies are a type of Ruby that holds an innate ability to change overall color dependent solely on the light source under which it is viewed. Feldspar comes in a variety of alluminosilicate forms, primarily potassium, sodium and calcium alluminosilicates. This naturally colorless mineral groups some of the more inexpensive gemstones – a result of the mineral itself being one of the most abundant in the world. Falling between a 6.5 and 7.5 on the Mohs Hardness scale, only a few of the gemstones harvested from this plentiful mineral are classified as gemstones. 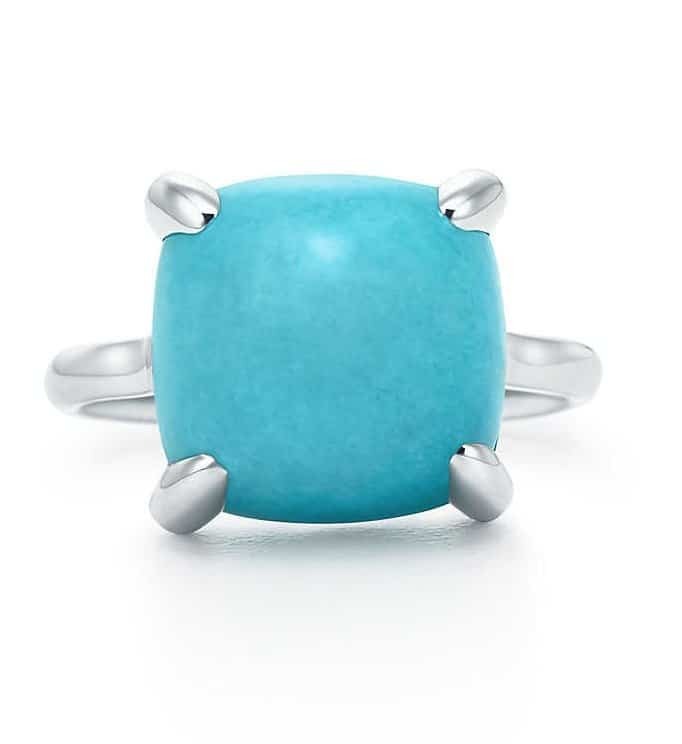 Amazonite is an opaque teal tinted gemstone that delivers impressive exotic appeal. 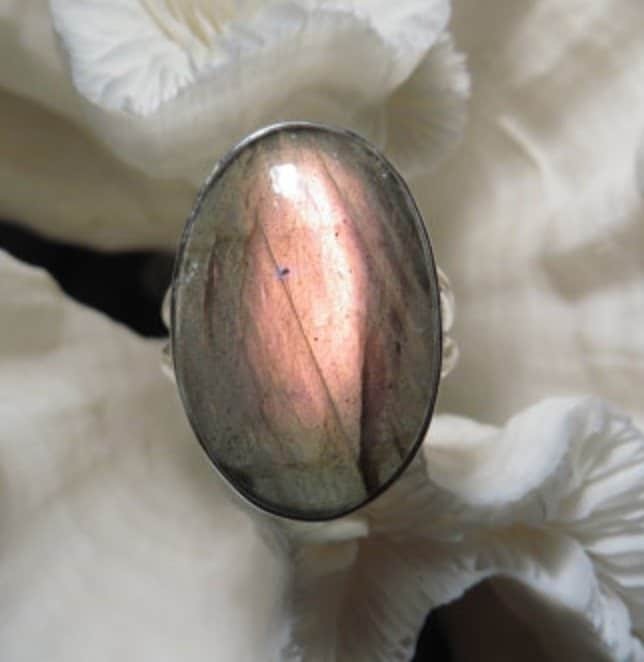 Andesine Labradorite is a warm semi-translucent Feldspar – its coloring falling within a warm toned mixture of pink and orange. 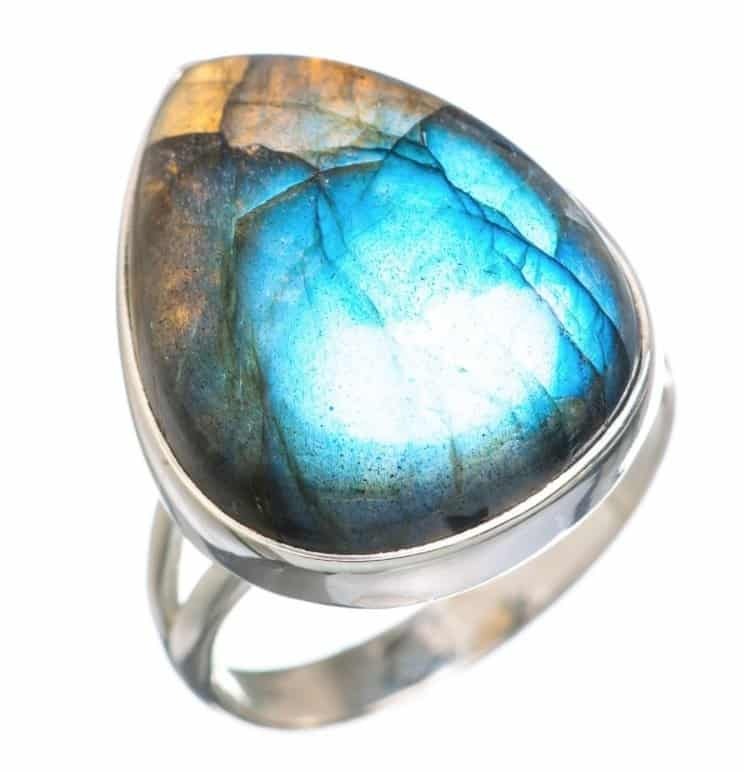 Labradorite is a unique gemstone whose labradorescence creates an other-wordly iridescence within the stone. 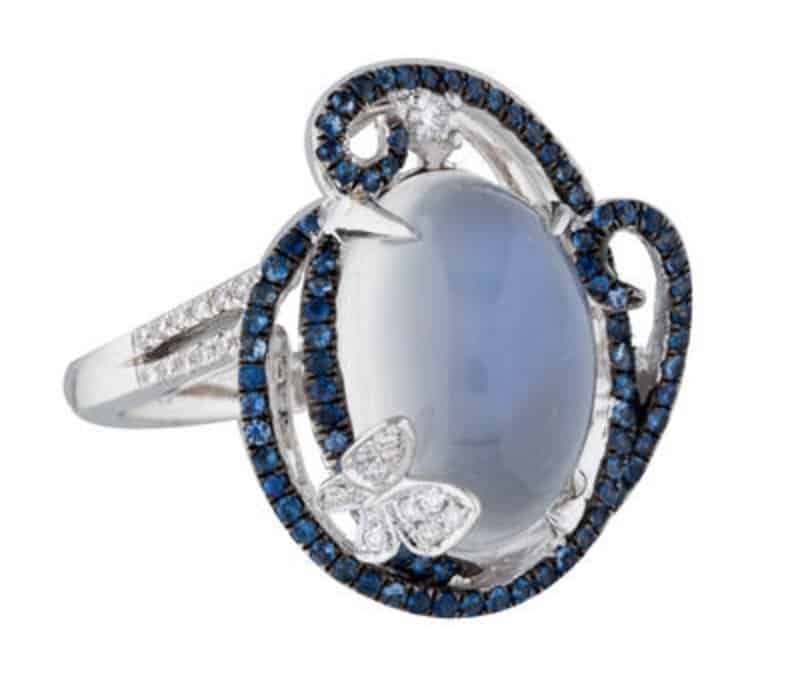 Moonstone is distinct form of Feldspar, typically found in light shades of blue or white and containing a mystifying adularescence created by the scattering of sunlight within the layers of the stone. 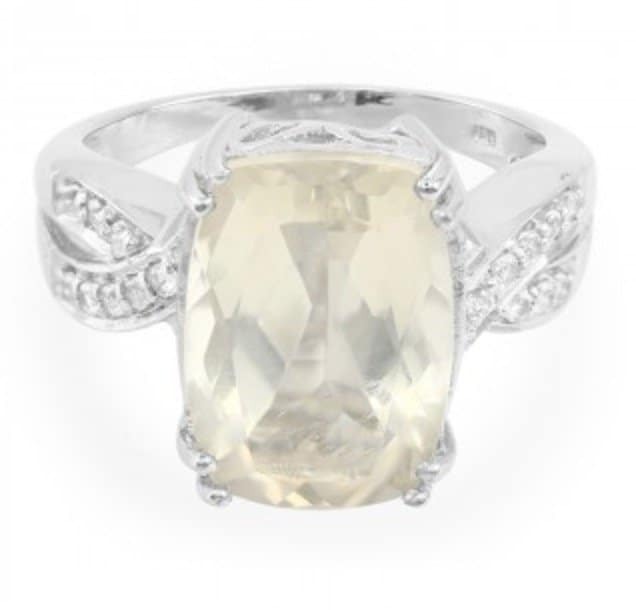 Orthoclase is an impressing form of the Feldspar mineral distinguished by its subtle yellow shade. Peristerite is a form of Feldspar that contains the same adularescense as moonstone – differing only in the fact that its overall shade is brown instead of blue. Spectrolite is a spectacular member of the Feldspar family – its labradorescense displaying a full rainbow of colors simultaneously! Sunstone is an warm tone Feldspar, whose coloring unsurprisingly reflect the yellows oranges and browns of the sun. 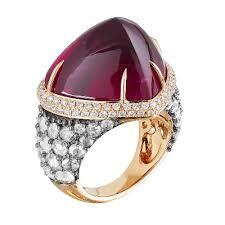 Garnet is a group of silicate minerals that falls between a 6.5 and 7.5 on the Mohs Hardness Scale. 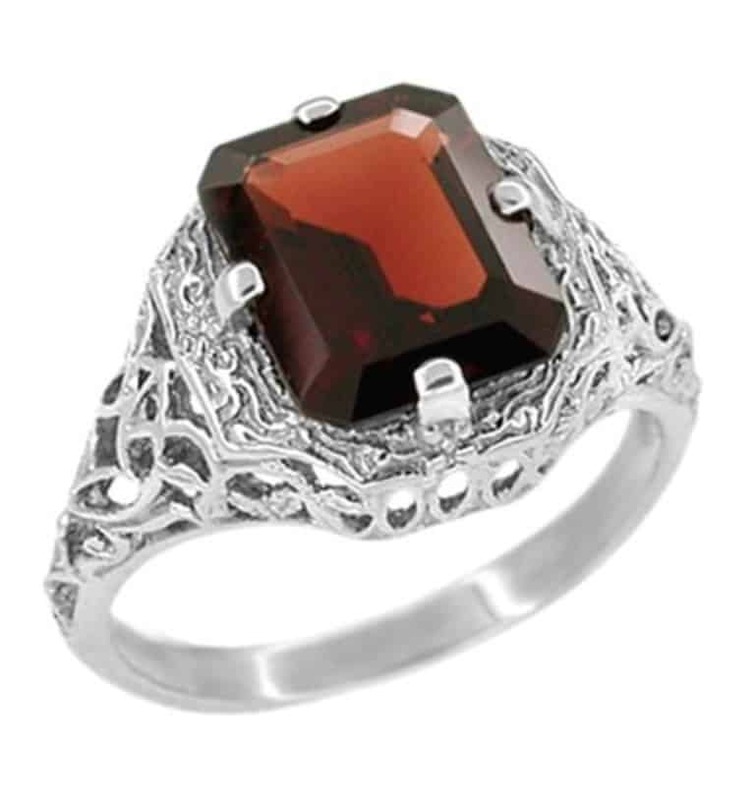 There are six types of garnets stones: Pyrope, Almandine, Spessartine, Grossular, Uvarovite, and Andradite. 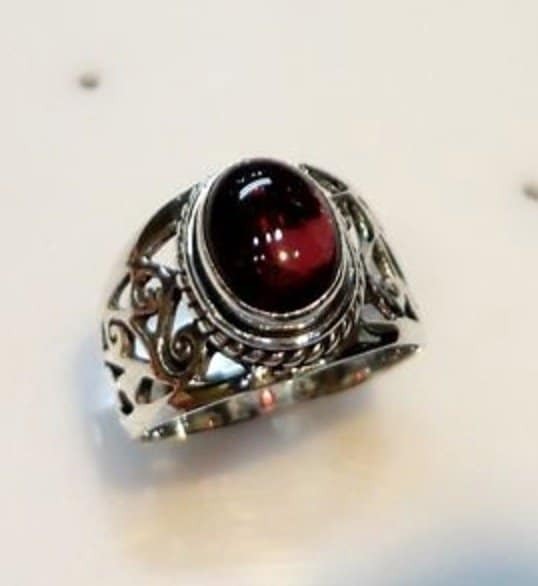 Each of the six garnet stones share similar properties, different minutely in composition – in contrast, garnet gemstones vary extensively in color and transparency. 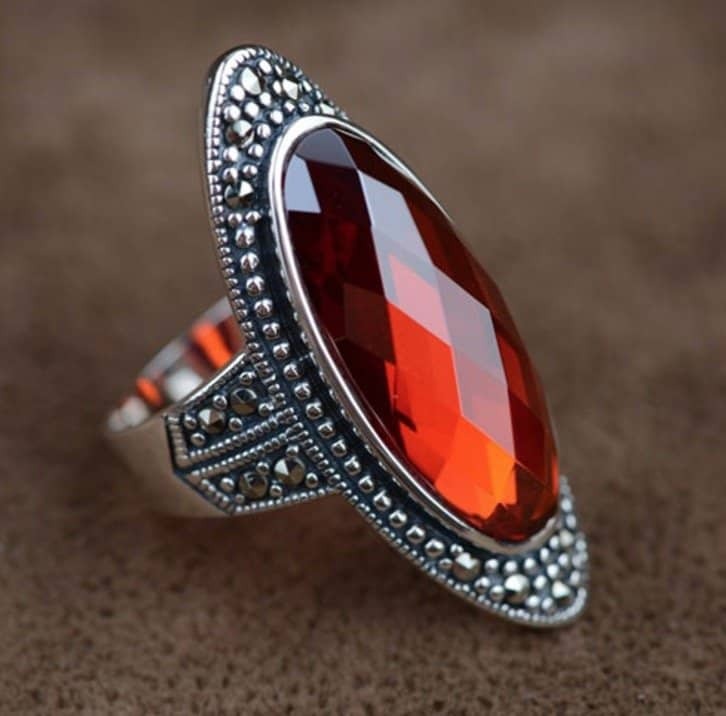 Although there are six forms of the garnet mineral, only a select few are of quality to be used in jewelry design and production. 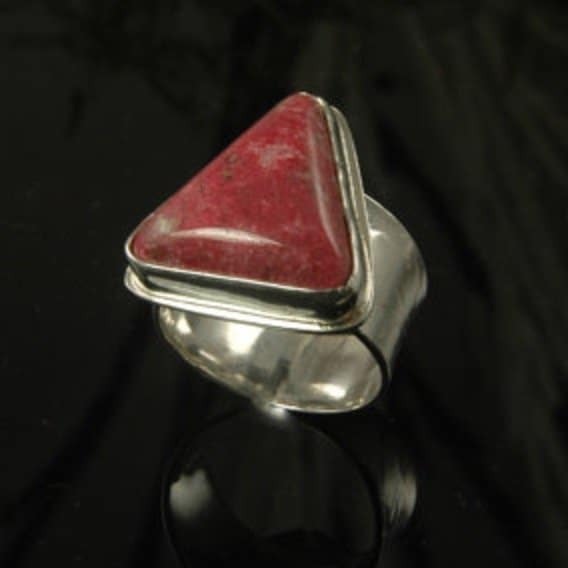 Almandine is an iron and aluminum silicate and is most adored for its crimson shade of red! Andradite is and calcium and iron silicate and forms a sub-group of its own: Melanite is the black variety of Andradite, Demantoid is a deep green variety of Andradite and Topazolite is a green tinted yellow variety of Andradite that is rarely stable enough to cut for the purpose of jewelry design. Grossularite is a calcium and aluminum silicate and its green color varies extensively in the shade and tone. Spessartite is a magnesium and aluminum silicate whose striking bright orange coloring earned it the nickname of being the mandarine garnet. 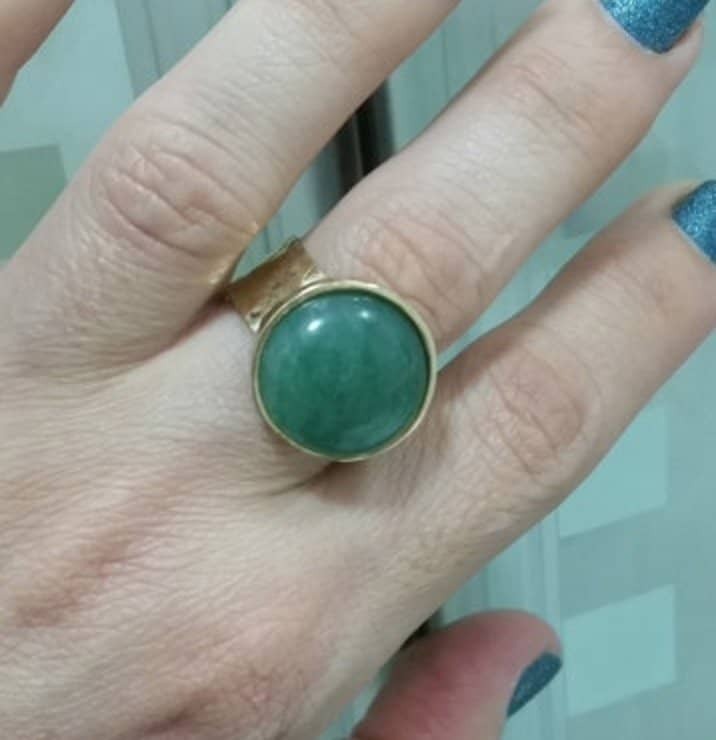 Jade is a unique mineral and/or gemstone because, technically, it’s a rock! Jade gains its categorization as a rock from its inclusion of various additional minerals. 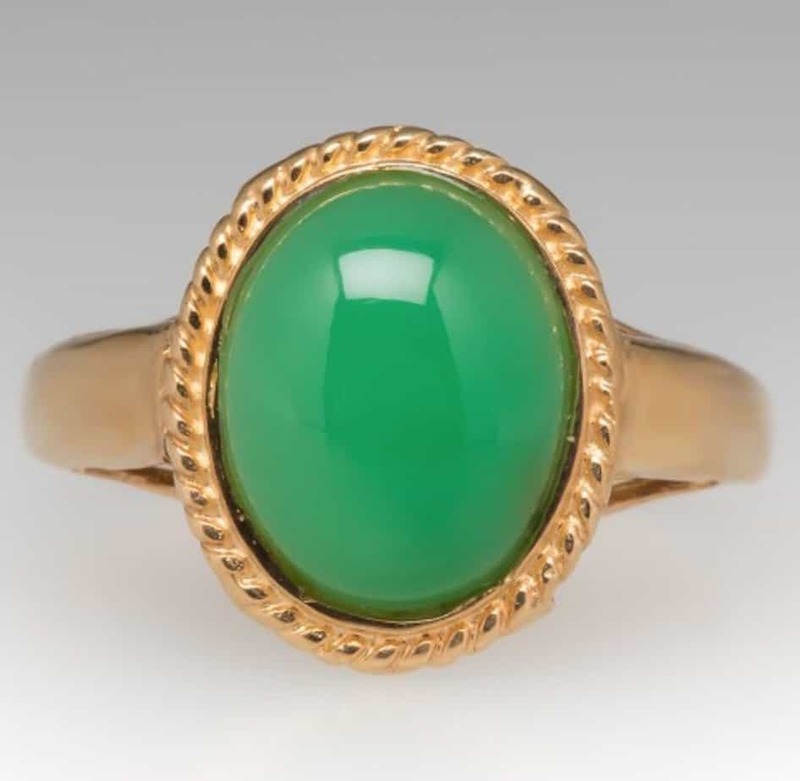 There are pure Jade minerals, though rare and hard to come by in absolutely pure forms, they are Jadeite and Nephrite and, in order to be sold or labeled as a Jade, a mineral claiming to be such has to be composed of a minimum of 20% of either – as that percentage goes up, so does the value of the gemstone in question. Chloromelanite is a dark green variety of Jade that is identifiable by its uneven black spots. Chloromelanite has a low percentage of Jadeite in it, making it a Jade gemstone by default. 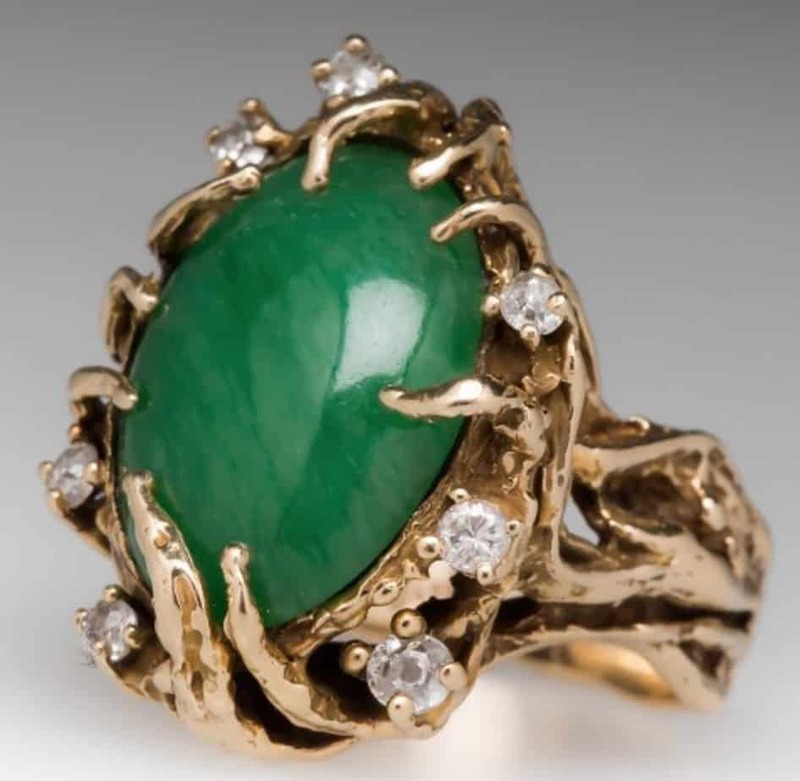 Jadeite is the most popular form of Jade, its color ranging from a deep and forest-like green to a bright green reminiscent of an apple, and at times expanding to varieties of pinks and yellows. Jadeite is one of the only two Jade minerals that are considered pure Jade. Nephrite is the second pure form of Jade and, for centuries before us, was thought to be one and the same as Jadeite. Though aesthetically similar to Jadeite, Nephrites color range does not expand beyond hues of green, but its ability to reach hues of green that border black makes up for that! 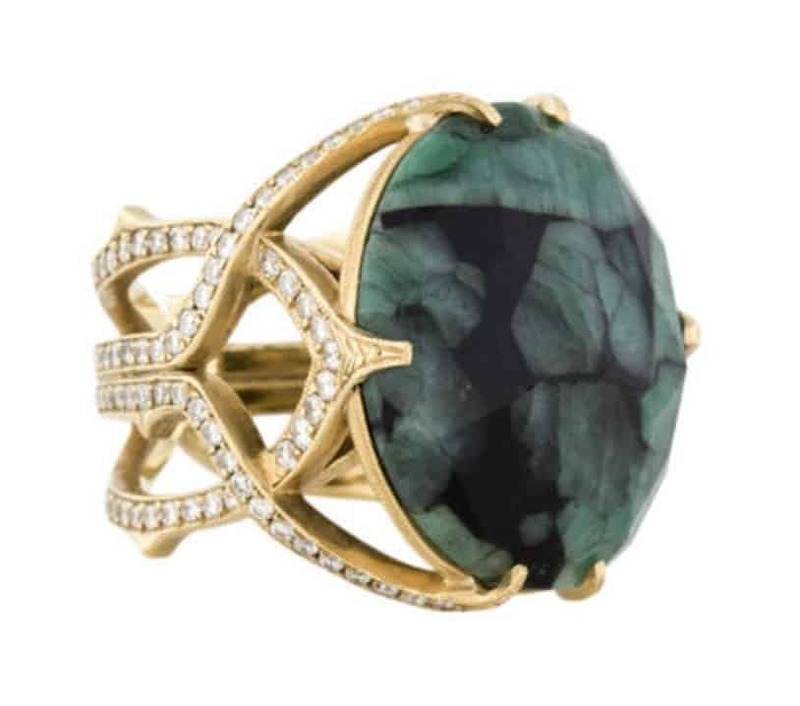 Maw Sit Sit is a beautiful green gemstone that’s densely mottled in black. This form of Jade is often disputed as being more of a neighbor to the group than an actual member. Ompachite Jade is a subdued, yet alluring shade of dark green whose categorization as Jade rests on the percentage of Jadeite or Nephrite in its composition. Opal isn’t an extraordinarily hard mineral, ranking between 5.5 and 6.5 on the Mohs Hardness Scale, but this hydrated amorphous silica’s beauty alone manages to keep it prominent in jewelry. 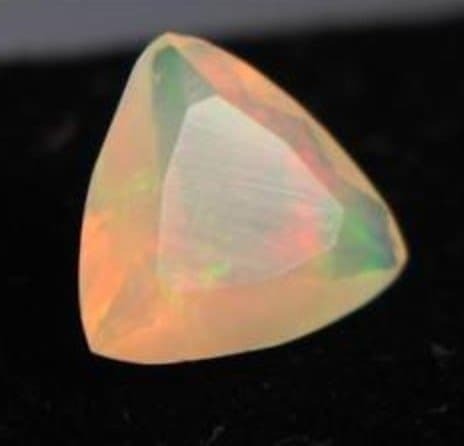 Opal minerals have three subgroups, each of which offers a different, yet equally desirable, trait: precious opal which offers enticing color play, common opal offers incomparable opalescence and sheen, and fire opal offers unsurpassed color quality and variety. Opal has no crystalline structures, but this minerals pearl like sheen and wide array of color (both of which can be attributed to its composition of up to 30% water) make it a heavy hitter in the world of gemstones. 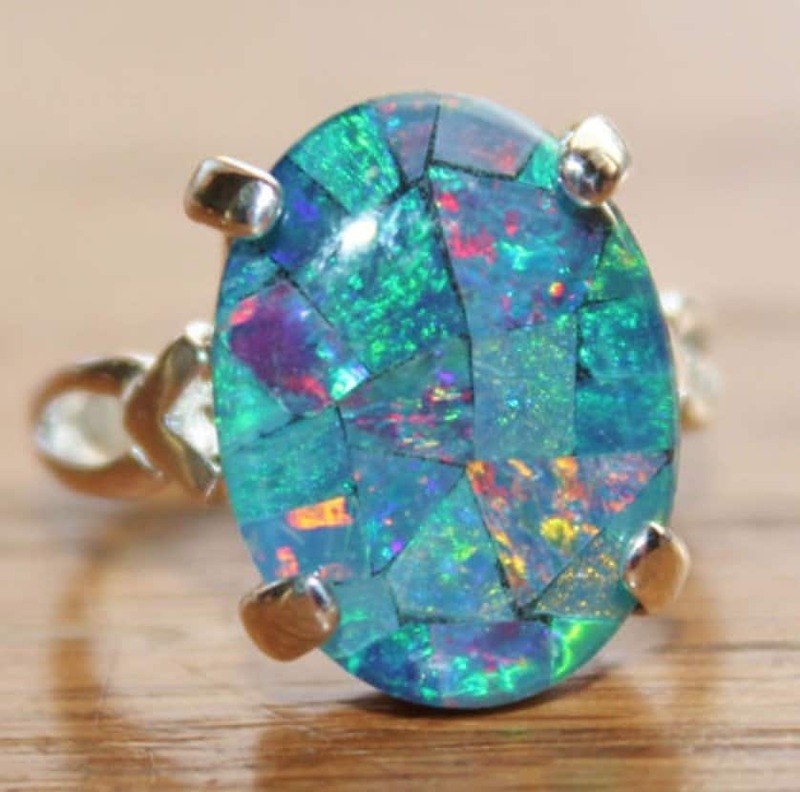 Black Opal is a form of the mineral that displays a black base, allowing for the bright blues and purples to stand out – black opal has been said to be reminiscent of the universe. 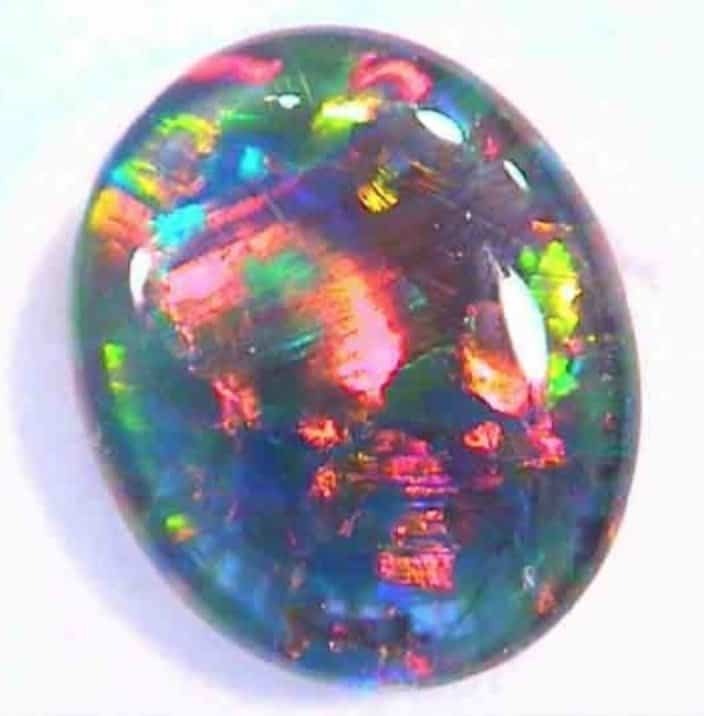 Australian Black Opal is the most valuable opal. 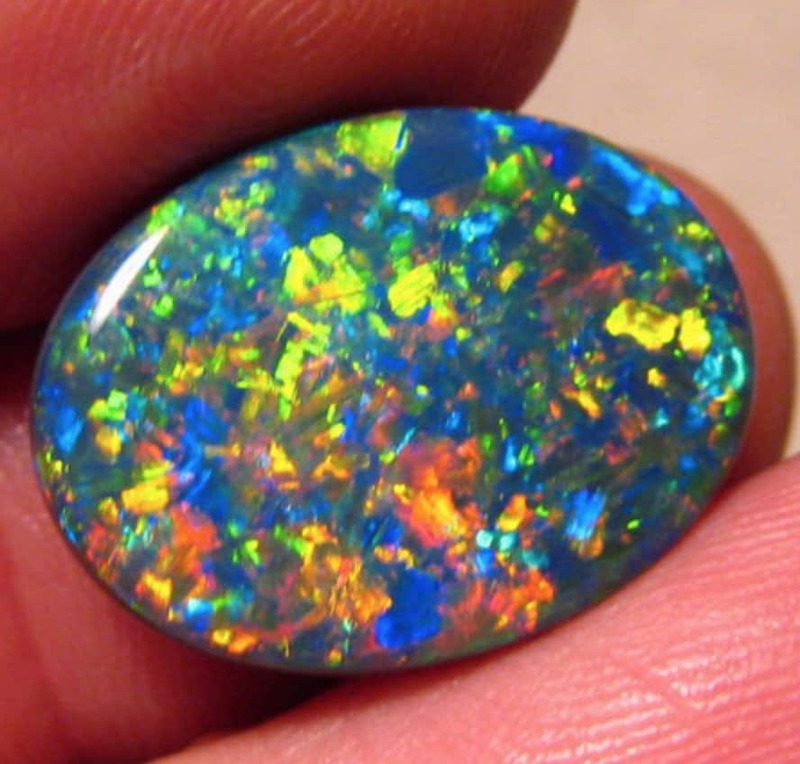 Boulder Opal is the rarest opal. This mesmerizing mineral has a dark brown base color with a variety of brown and light blue colorations throughout the stone. Chocolate Opal varies in its base coloration but is most often found in shades reminiscence of, you guessed it, chocolate. Chocolate Opal is speckled with bright greens, blues, yellows and oranges – all of which merge together to create an impressive end piece. Common Opal is the type of opal that does not display a vivid play on color when compared against its counterparts, but what it makes up for that with is a more intense opalescence and higher sheen! 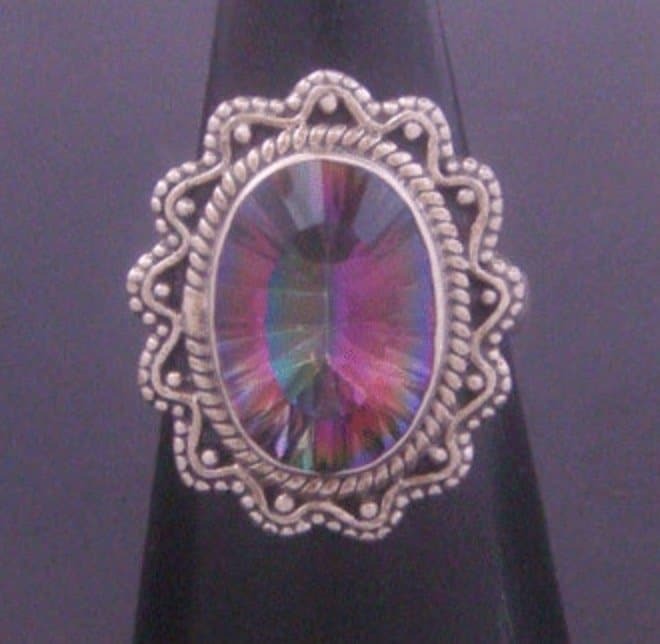 Crystal Opal varies in color because it encompasses all the opals mentioned in this list. 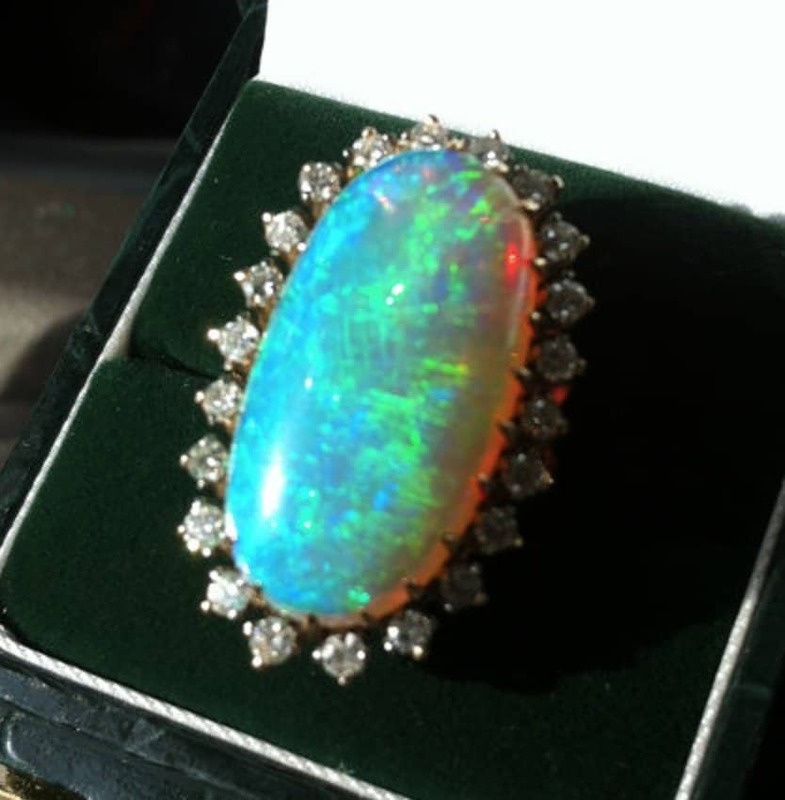 Crystal Opal is the name given to translucent opals, regardless of their colorations. 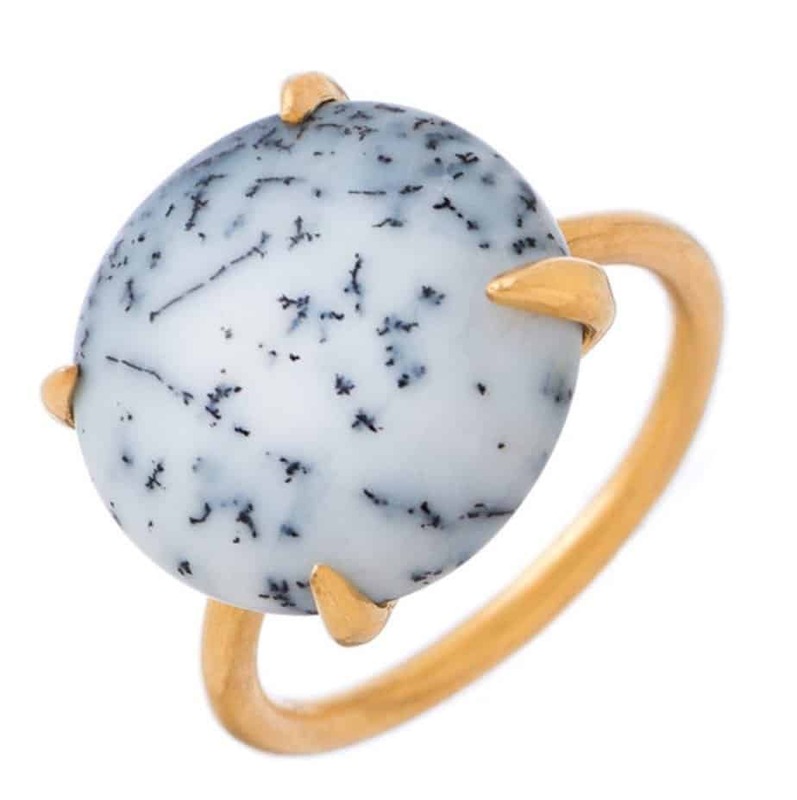 Dendritic Opal is a white opal with distinct black markings throughout its entity. 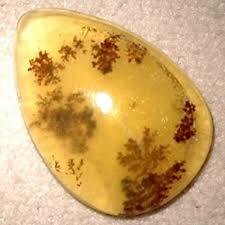 As a common opal, Dendritic Opals have impressive opalescence and sheen. 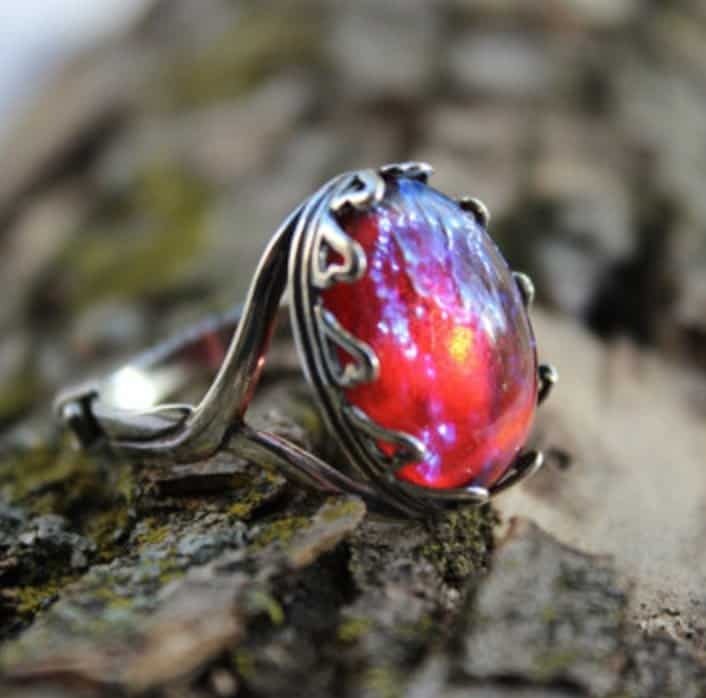 Fire Opal are crystal, or translucent. opals that carry an unsurpassed quality of red, orange and gold stones accompanied with the beautiful multi-colored pigmentation for which opals are best known! Harlequin Opals are as rare as they are extraordinary. Harlequin Opals are multicolored Opals – not much different from the rest, right? Wrong. 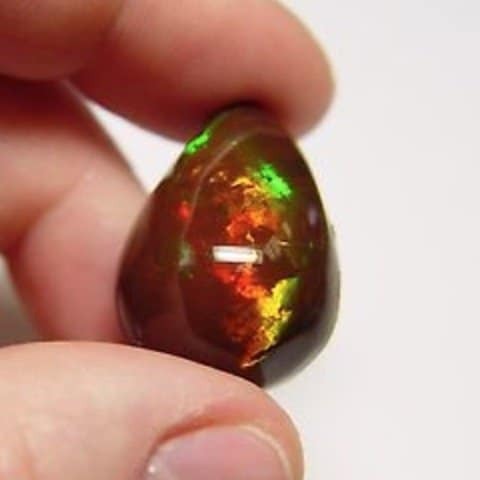 The colors of the Harlequin Opal are systematically patterned, making for a unique mineral unlike any other. Honey Opals are dazzling honey hued varieties of the common opal. 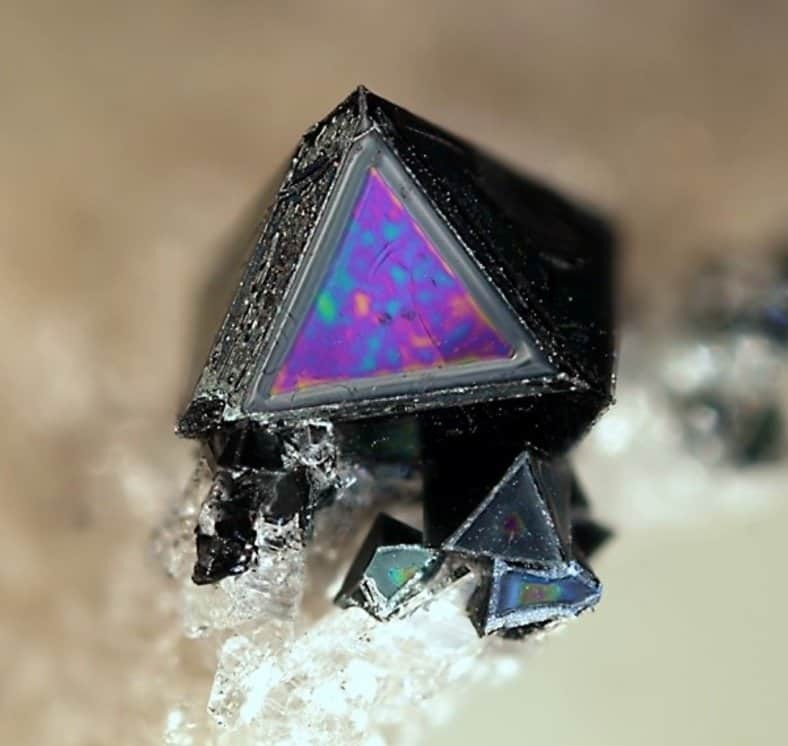 They have much less coloration than fire opals, and can thus be distinguished from them, but make up for the lack of a color show by their elevated opalescense. 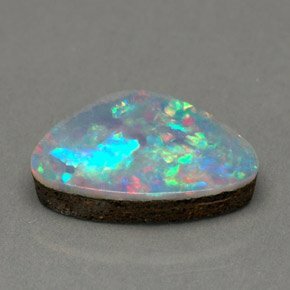 Hyalite Opals are a translucent and colorless variation of the opal. Hyalite Opals majestic colors are often displayed deep within the stone, though the colors are hard to explain as anything but sparkle. Hydrophane Opals are milky or light tan opals with a slightly dispersed and subdued rainbow of colors scattered throughout their surface. 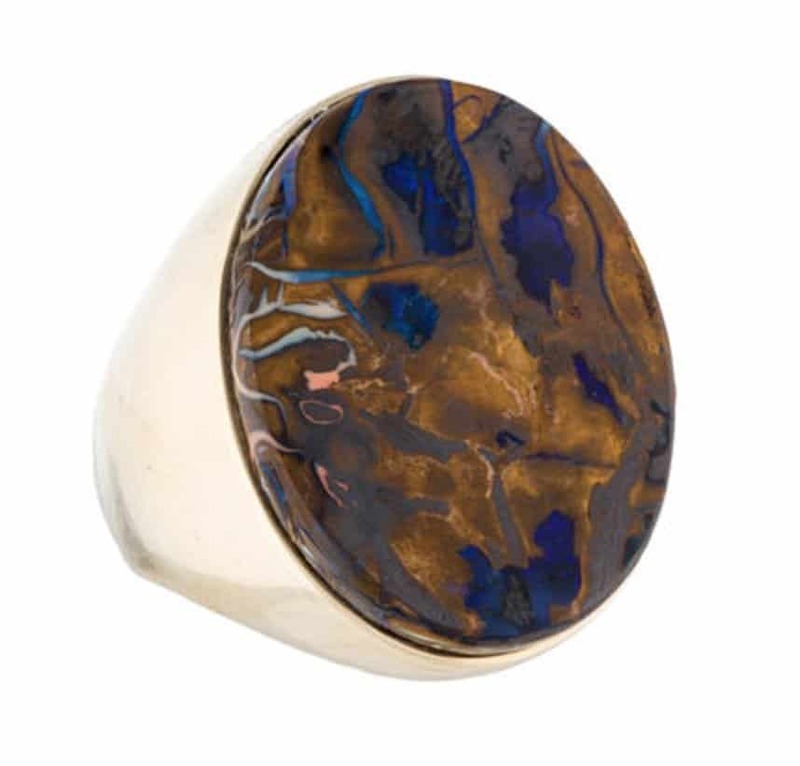 Hydrophane Opals are becoming more popular and more abundant in the modern era, and we can’t blame them! Jelly Opals appear as though their breathtaking array of colors is deeper within the stone, and consequently, make the colorless and transparent body appear jelly-like! 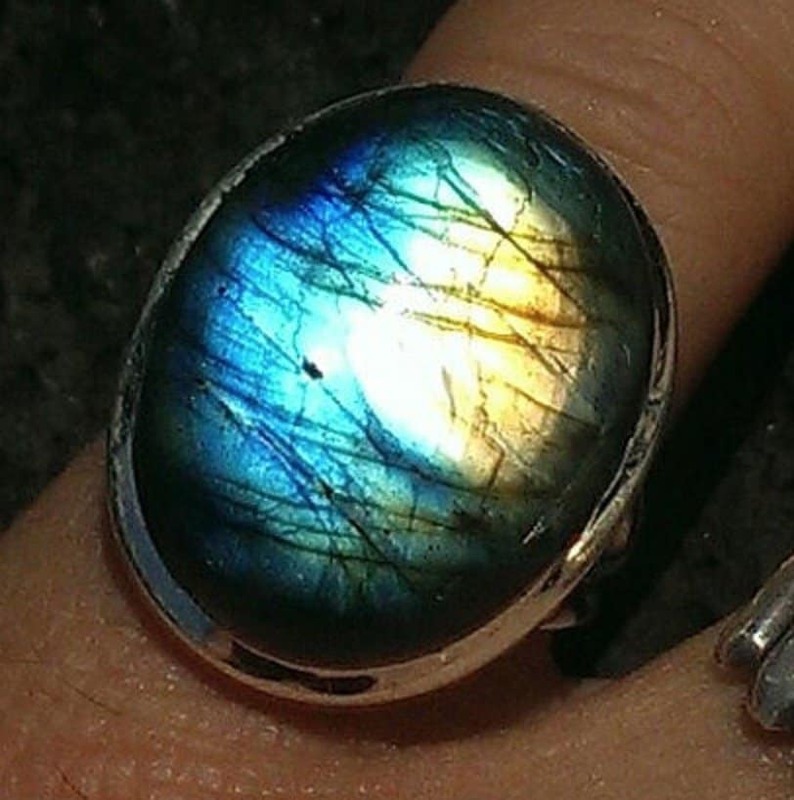 Jelly Opals are extremely rare and should be purchased with caution. 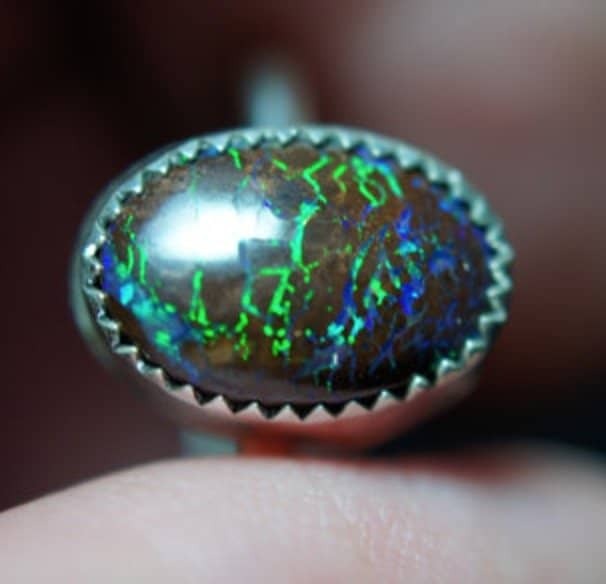 Matrix Opal offer a unique coloration to chocolate opals – instead of random specks or organized patterns, matrix opals are identified through their random streaks of color! Moss Opal is a good choice of opal for the nature loving bride and groom due to its resemblance to a moss covered tree – the subdued colors are uncharacteristic to this particular mineral, but they are a sight for sore eyes! 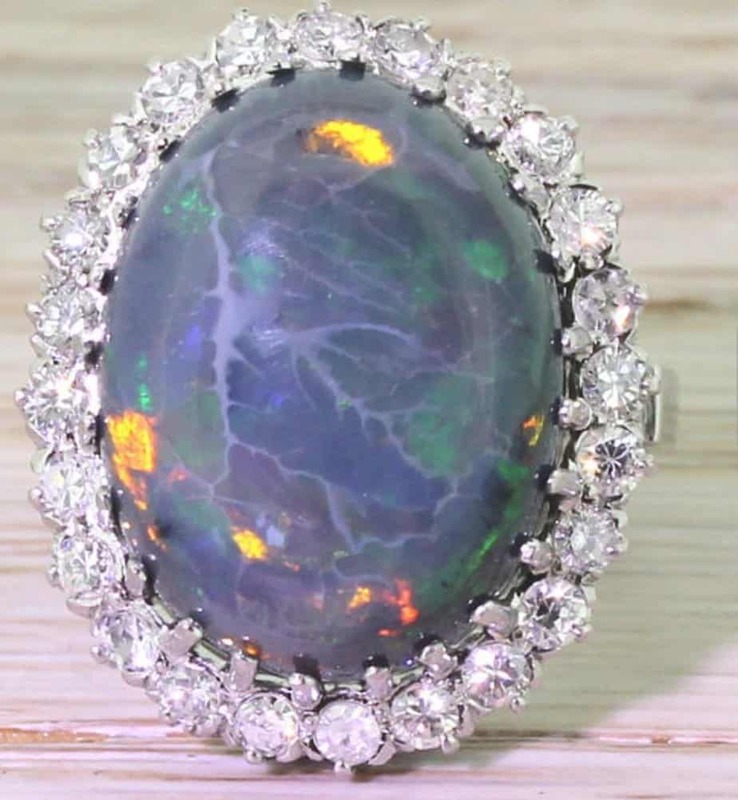 Opal Doublet is the term used for an opal enhancement where the designer adheres a black glass backing to the opal to intensify its color pigmentation. Opal Triplet is another term used for a man made enhancement where a slice of opal is placed between a black glass backing and a domed clear quartz – resulting in a product that appears quite similar to opal…but isn’t. 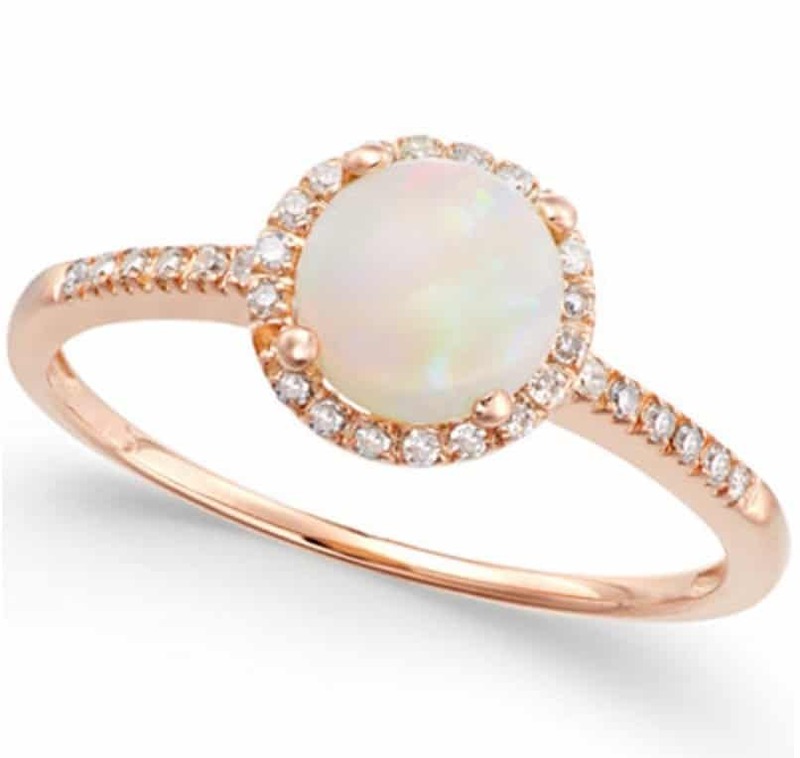 Pink Opal is a beautiful pastel pink Opal that looks particularly ravishing when paired with rose gold! 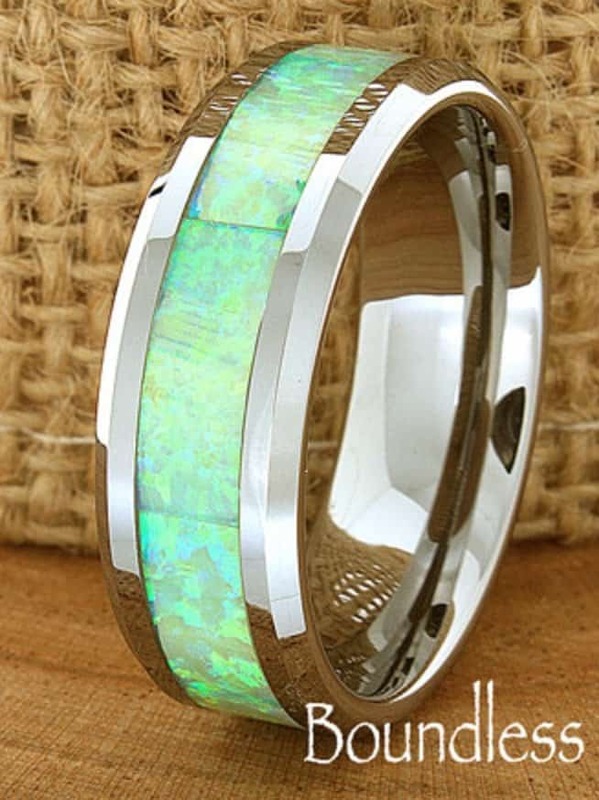 Prase Opal is a bright green opal that gets its coloring from the presence of Nickel. Porcelain Opal is a common Opal that focuses more on the quality of the stones Opalescense than it does the variety of color – though the green is quite stunning! Precious Opal is the style of Opal that focuses on the interplay of color within the Opal – these Opals have the most diversity in coloration and variation. 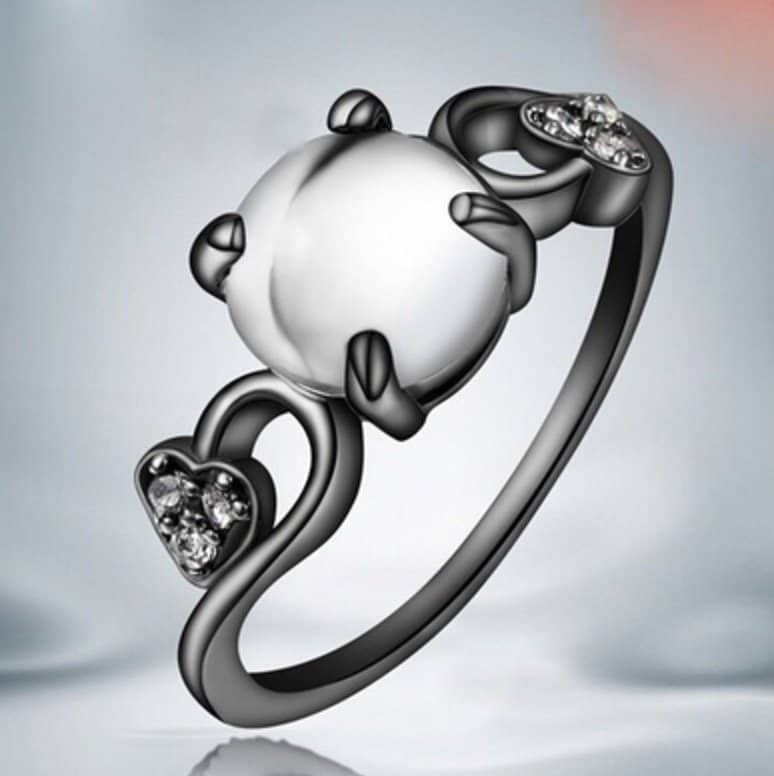 Due to the amount of layers, and the thickness of them, precious pearl is completely opaque. White Opal is one of the most common and inexpensive opal’s out there, making it completely underrated when paired against its luster and beauty. 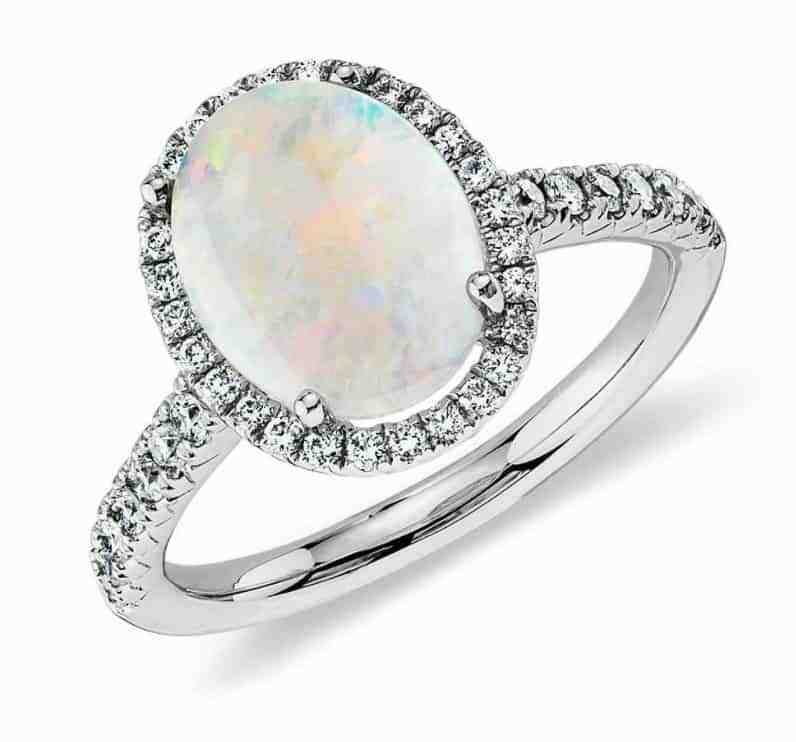 White Opal is an elegant milky white, pearl-like, addition to any wedding and/or engagement band! White Opal will have color variation, though the colorations will be light toned – making it an ideal stone for a bride and groom looking for a soft and elegant touch. 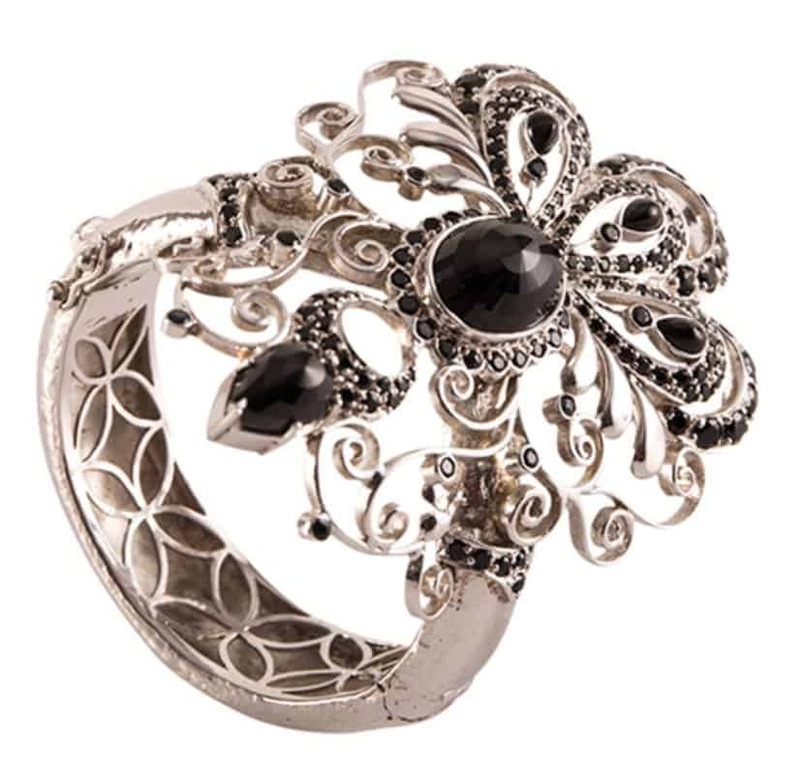 Onyx is one of very few dark, and sometimes even black, stones that have managed to break out into the world of jewelry. 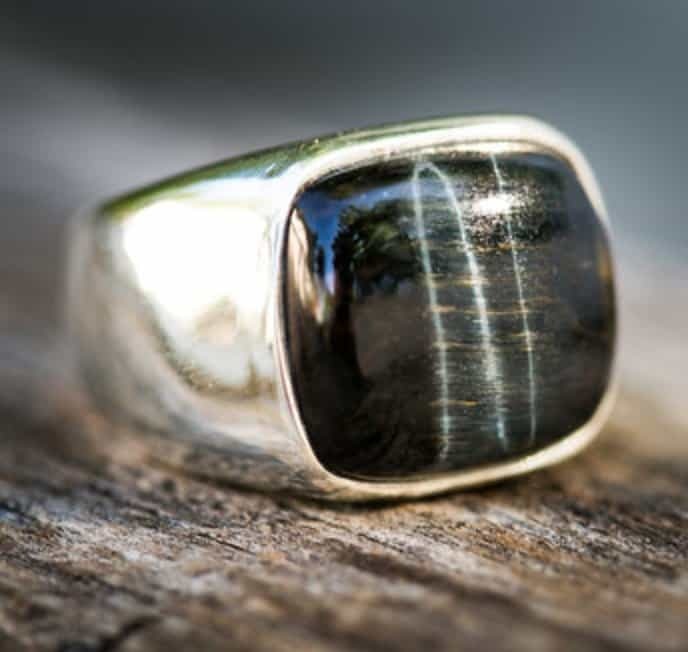 Untreated Onyx typically has a white band that goes through the mineral, while purely black Onyx has typically undergone enhancements to attain its uniformity. As the second most abundant mineral in the world, Quartz is an abundant and versatile microcrystalline group that encompasses some of the humanities favorite gemstones. Quartz is broken up into two sub-groups, macrocrystaline and mictro-or crysto- crystalline. Macrocrystaline stands for the types of Quartz stones that form in distinguishable and solid pieces, while microcrystalline quartz’ are much smaller. 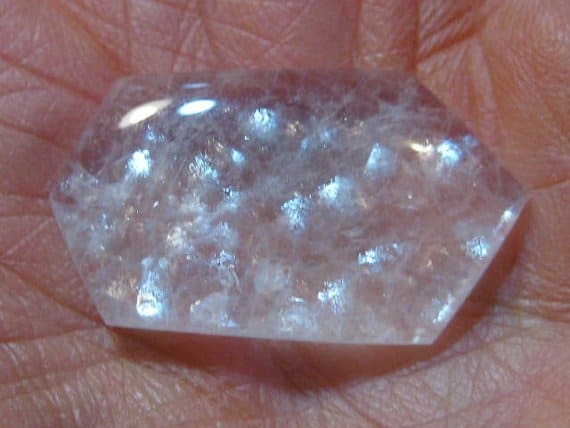 Microcrystaline Quartz breaks further down to encompass fibrous and grainy microcrystalline quartz. If you want to know more about the chemical makeup and subgroups of this mineral, visit our page on Quartz for useful information. Quartz is rated at a 7 on the Mohs Hardness Scale, which isn’t as high up as some of its competitors, but this slight deficit is made up for the minerals affordability and wide-spectrum versatility. Agate Quartz is a banded, think layered, quartz. Agate Quartz can come in a variety of colors, though it’s most popular shades are earthy – such as greys, browns and oranges. Due to its delicate nature, Agate Quartz isn’t typically used for jewelry, especially not wedding or engagement bands, but makes a great stone for statement jewelry. 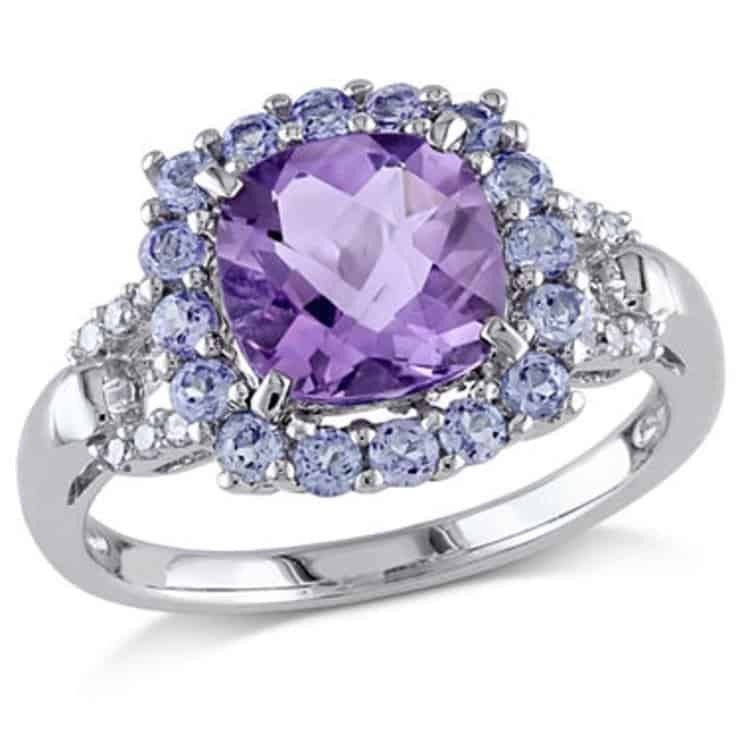 Amethyst is an undeniably beautiful violet variety of Quartz with a rich history! 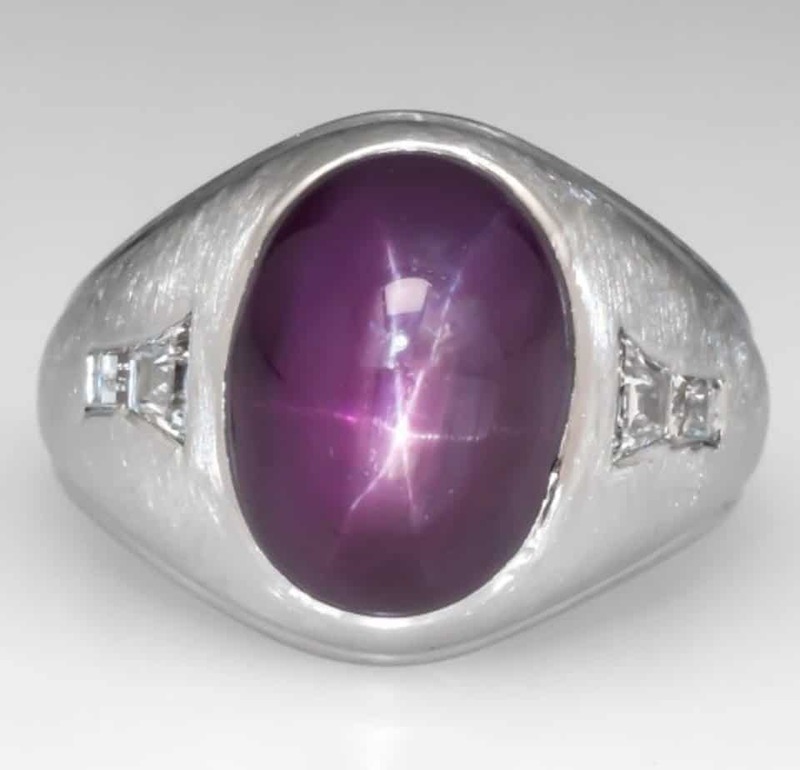 The name Amethyst translates to the Ancient Greek word “intoxicated” and it was believed that the stone shielded those wearing it from drunkedness and clouded thinking. Ametrine is a mixture of the Quartz amethyst and citrine. Through their mixture, these two minerals create a unique two-colored translucent stone whose contracting coloration draw awe to the piece as a whole. Aventurine is an attractive green quartz. While green is a very popular color in the world of gemstones, Aventurine stands up against the rest with a distinctive spark caused by internal inclusions. Bloodstone is a dark and eerie quartz for the bride and groom that like horror and gore! This dark brown or black quartz is adorned in specks of red, which give the illusion of splattered blood, and resulting in a mysterious and seriously intriguing stone. Blue Quartz is the name given for a quartz mineral whose inclusions create a breathtaking blue gemstone. Blue Quartz gets its coloring from microscopic inclusions, and the shade of blue is dependent on the material with which the quartz is included. 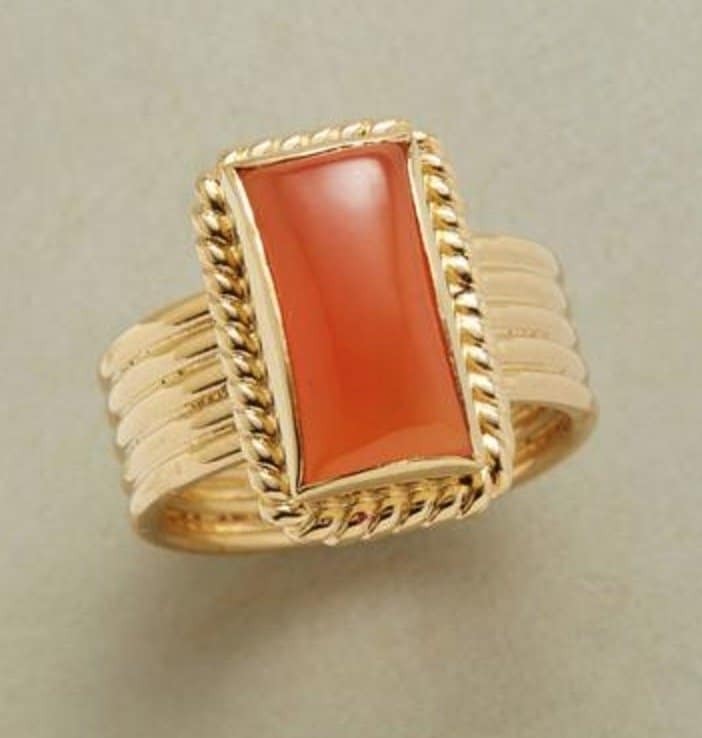 Carnelian Quartz is an opaque form of quartz whose color ranges across the spectrum of orange – from a subdued yellow-orange all the way to a sophisticated mahogany hue. Chrysoprase Quartz is an opaque quartz whose coloring results from nickel inclusions – this lustrous gemstone combines the coloring of freshly cut grass with the sheen of a precious pearl, creating a captivating and arousing gemstone. Citrine Quartz ranges in its color from yellow-orange to dark orange. This translucent gem gets it color for microscopic iron inclusions. 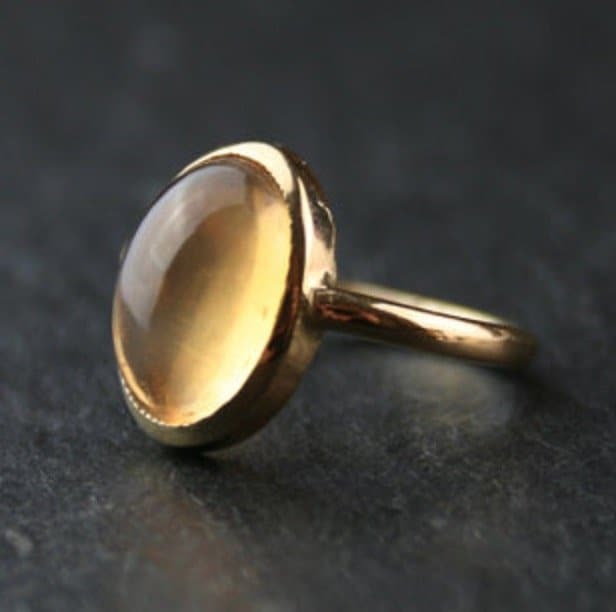 Natural Citrine is extremely rare, so it is important to bear in mind that most citrine studded stones on the market have been enhanced, and it is even more important to learn of their enhancements to ensure proper care of the stone. Hawks Eyes Quartz is characterized as much by color as it is by design. 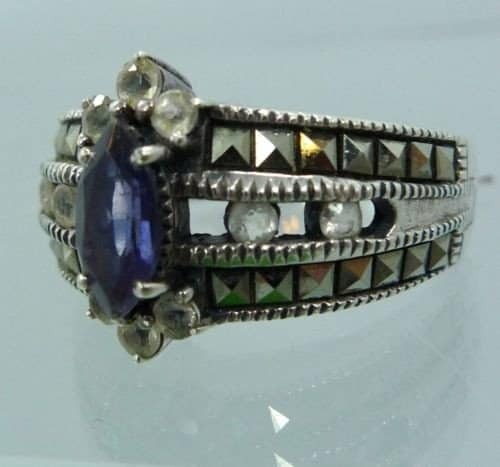 This bluish grey stone is adorned with a chatoyance, or optical illusion, that creates a band that is of striking resemblance to the eye of a hawk. 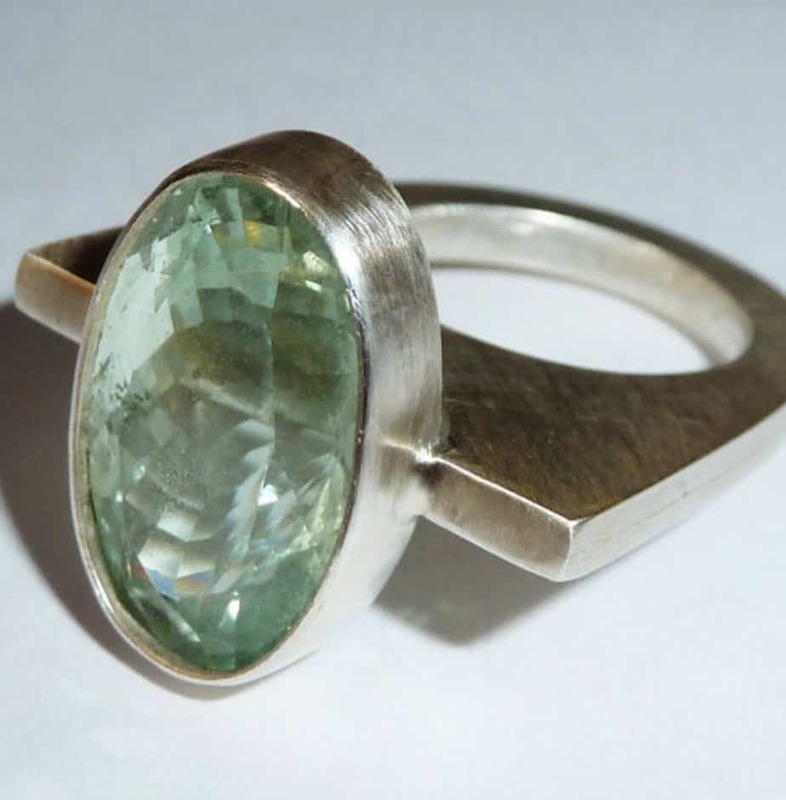 Prasiolite is a light green form of quartz, so light that at times it can appear to be completely colorless. Natural prasioliteis extremely rare, but even so it isn’t highly sought after despite its inarguable beauty. 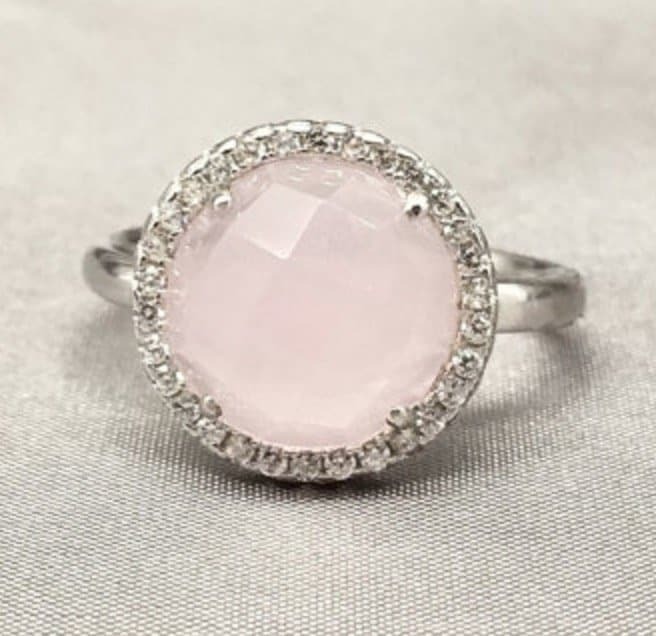 Rose Quartz bears a delicate and feminine hue of pastel pink and is one of the most popular pink stones on the market. 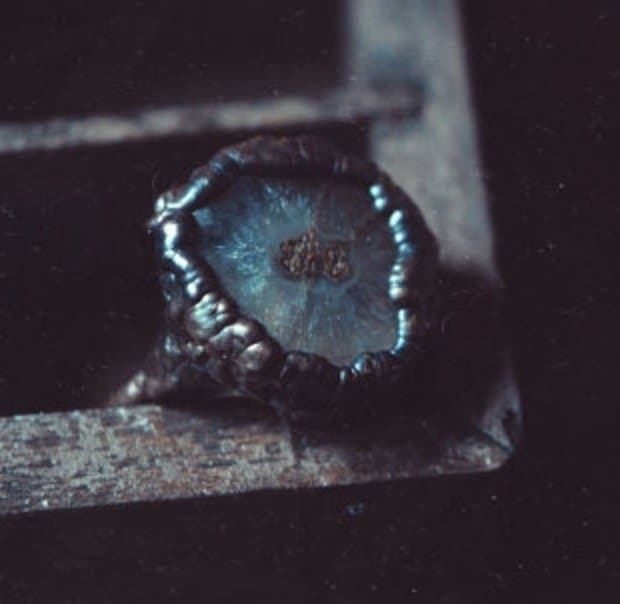 In some events, the inclusions of this stone will create a unique internal star. 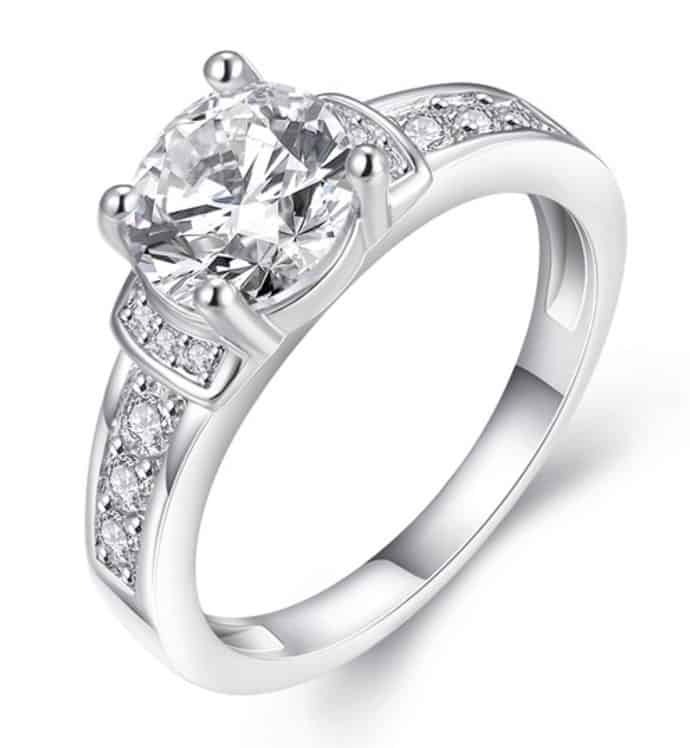 With or without the star, however, it is clear to us why this stone has the demand it does! 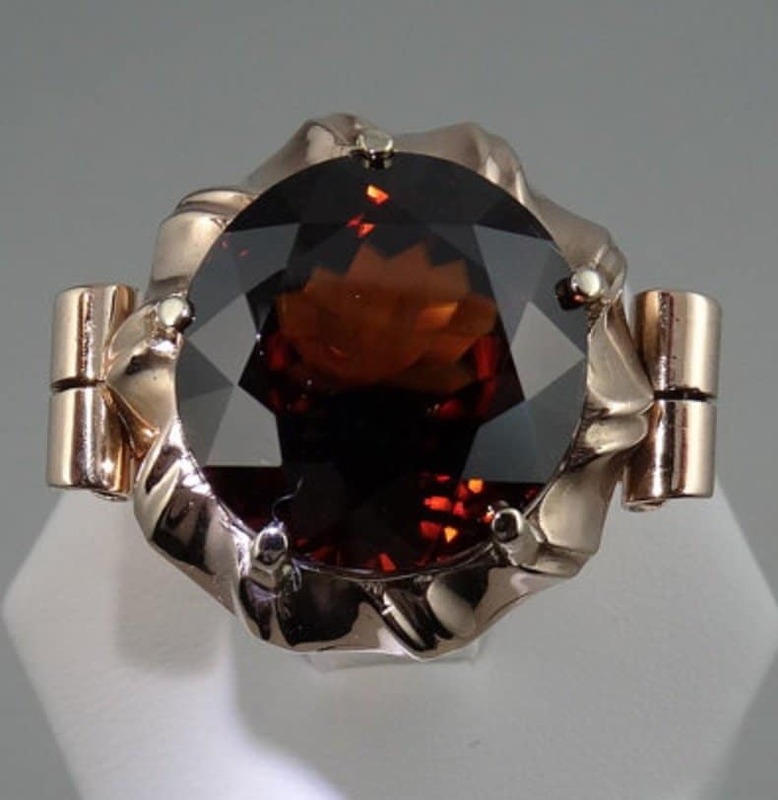 Smoky Quartz is another dark stone in the Quartz family that has reached surprising levels of popularity. This incomparable mineral ranges in color from light grey to nearly black, encompassing all the colors of smoke – hence its name. 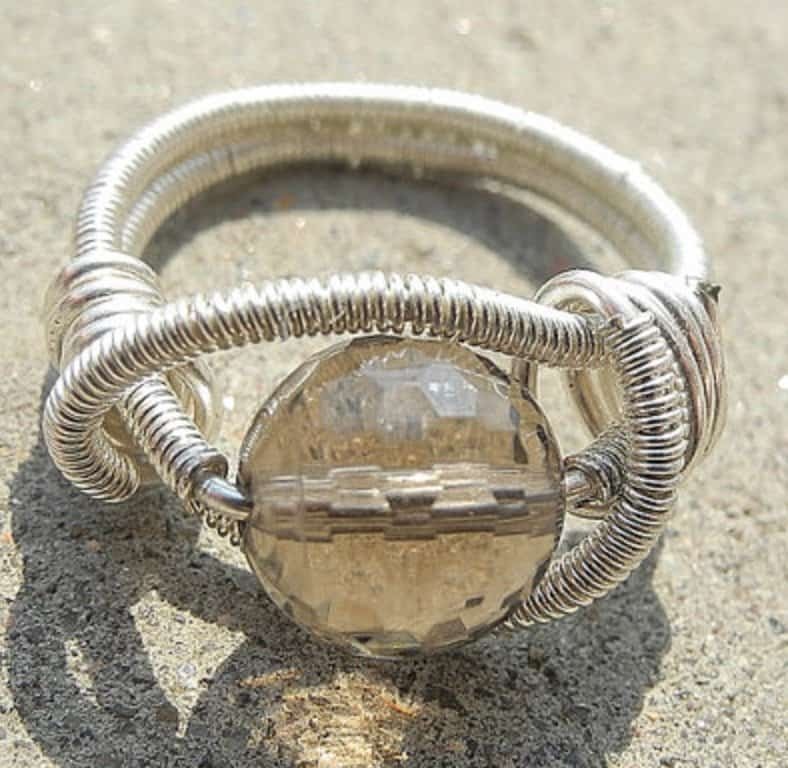 Smoky Quartz is one of few minerals that offers a light grey stone that still possesses the luster and desirability to be considered a gemstone. 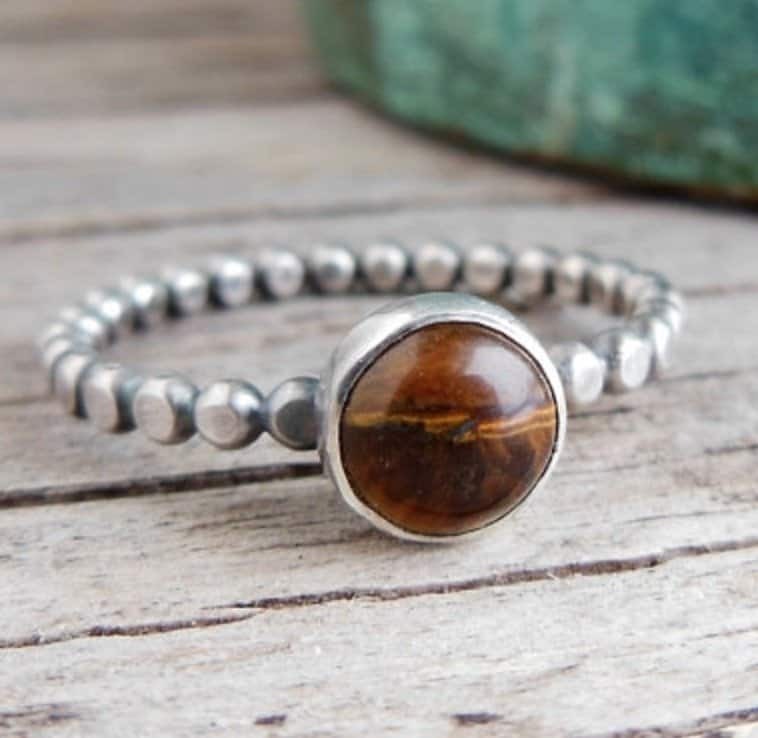 Tigers Eye is the evolved version of the Hawk Eye – while it still contained the illusion of an eye, Tigers Eye stones range between shades of brown – to which the transition from the blues and greys of Hawk Eye Is a result of the oxidation of iron within the stone. The Spinel group of gems encompasses a wide variety of magnesium oxides that have a Mohs Hardness rating of 8. These stunning stones contain both magnesium and aluminum and are often found in captivating shades that range from a bluish-violet hue to red. Gemstones in the spinel family have been historically mistaken for rubies, though a spinel stone that holds the mesmerizing red hue of a ruby is extremely rare and very expensive. Almandine are spinel stones that are sometimes given the name “candy spinel” for their playful violet, blue tinted, coloring. Balas is a light red hues form of spinel, sometimes misnamed the “spinal ruby”. 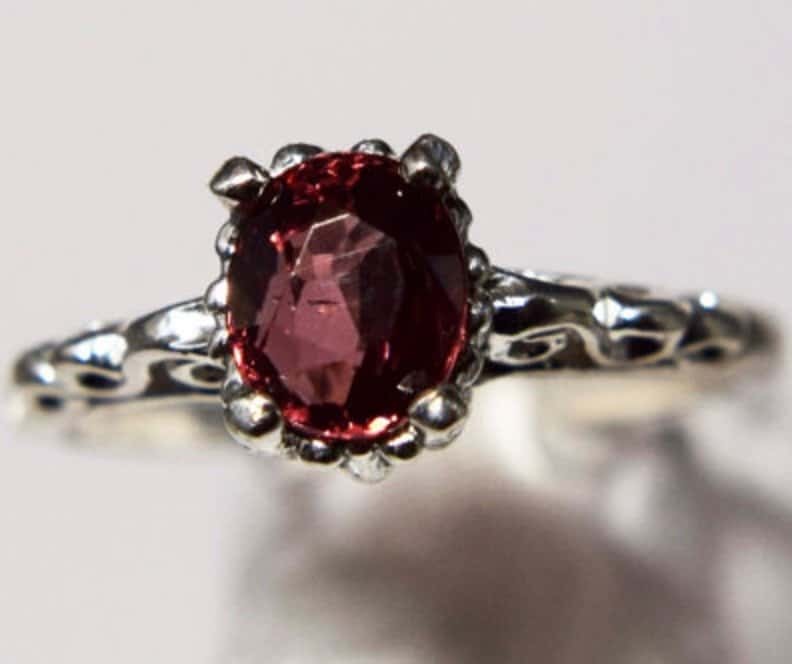 This beautiful stone is an ideal choice for a bride or groom interested in a stone with the high profile of a ruby, minus the associated price-tag. 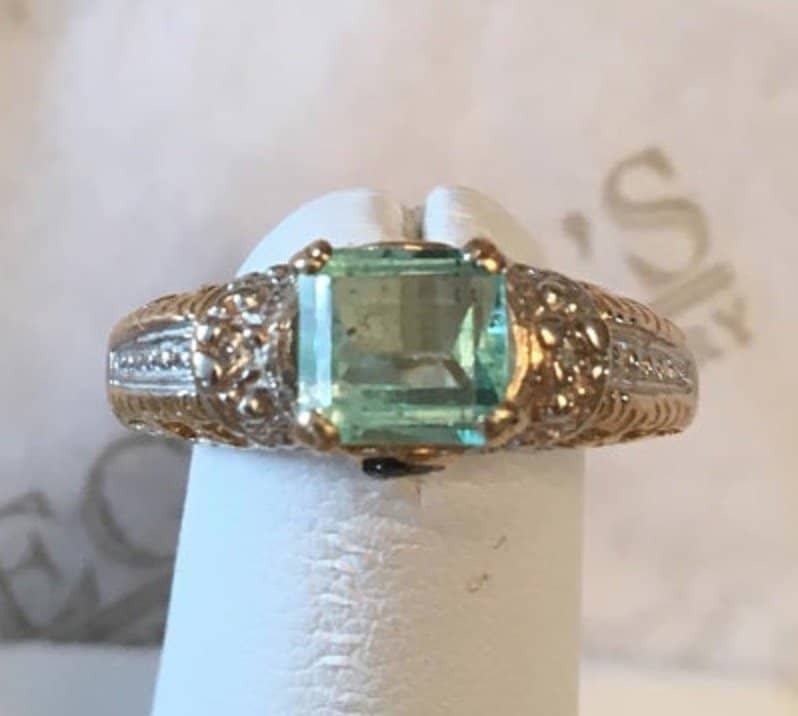 Chlorspinel is a copper inclusive form of spinel that displays pastel shades of green – this stunning stone would pair beautifully with a wooden band to create an organically stunning entirety. Hercynite gets its dark green, sometimes black, coloring from its inclusion of iron. 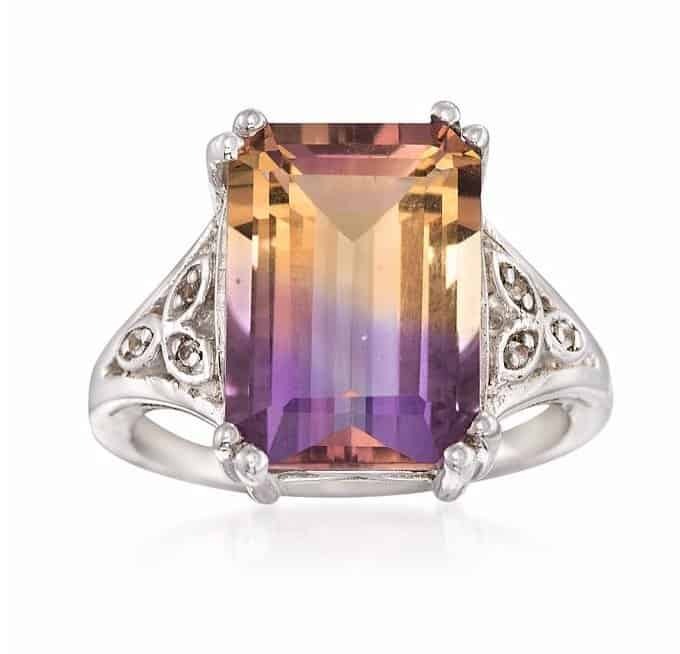 This gemstone, in its rarest form, might also contain stunning shades of dark purple. 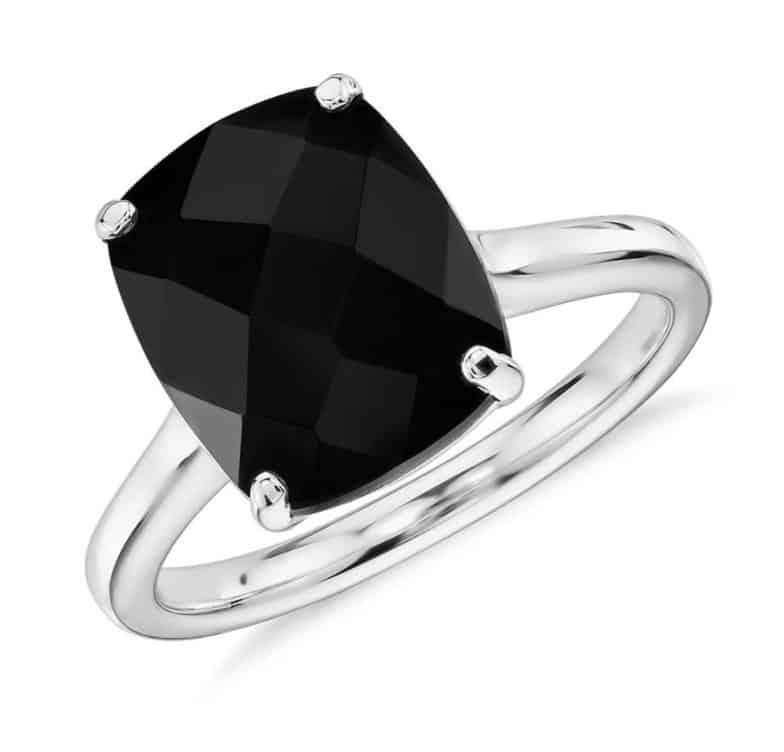 Pleonaste is a form of spinel that comes in shades that range from dark blue to dark green. Pleosnate is a relatively abundant form of spinel. The name of this opaque stone is actually Greek for “abundant”. Rubicelle is a unique and popular form of spinel. This translucent stone ranges from yellow to an orange tinted pink and can sometimes display both colors simultaneously. The Spodumene family of minerals are silicates of aluminum and fluorine. These minerals range from 6.5 and 7 on the Mohs Hardness Scale. Spodumene gemstones have a wide variety of colorings, most of which aren’t typically used as gemstones due to their tendency to fade easily as well as their lower rating on the Mohs Hardness Scale. Of the Spodumene Group, the most popularly used stones are a light, to nearly transparent, shade of yellow. Hiddenite is a form of Spodumene that gets its coloring from the presence of chromium. 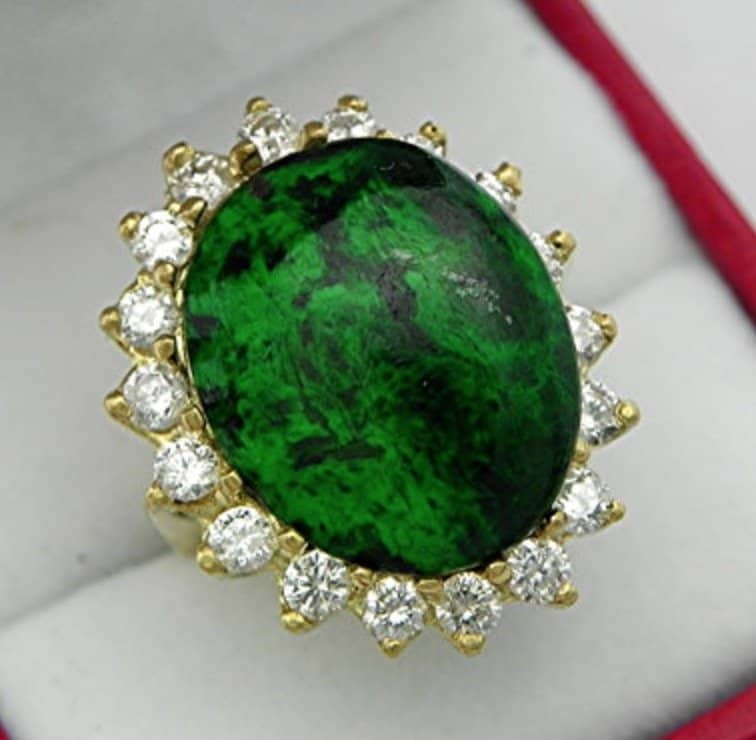 This gemstone is typically light green/yellow, increasing in value with the intensity of its green shade. 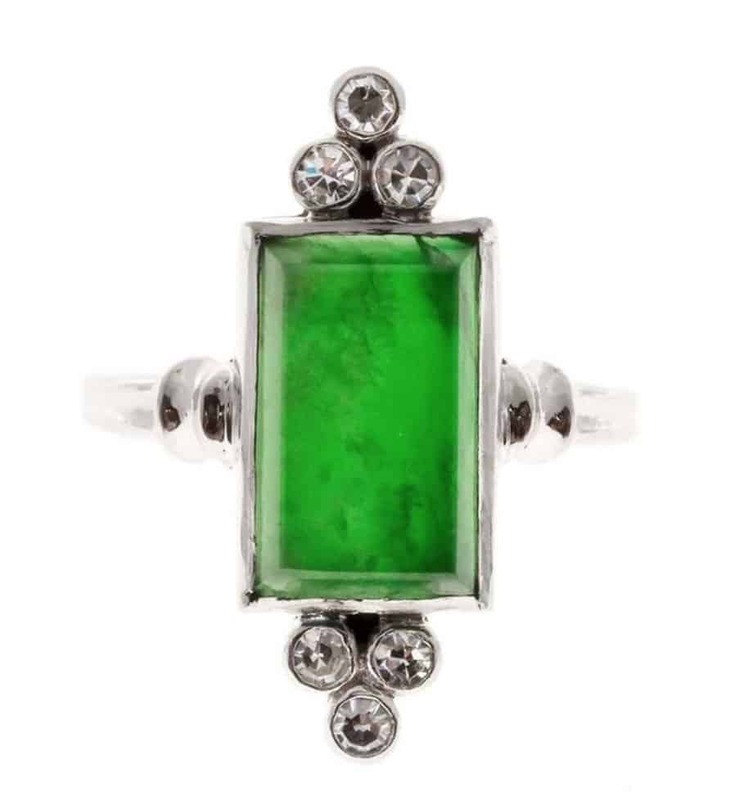 Dark, forest like, green Hiddenite stones are the rarest and most valuable of this variety. Kunzite are a unique variety of the Spodumene variety whose colors range from intense pink to prominent purples! Kunzite gets its marvellous shades from the presence manganese, and is unsurprisingly the most popular form of Spodumene. The Topaz group contains stones that are silicates of aluminum and fluorine. This group of minerals has a Mohs Hardness Rating of 8 which, combined with their extensive history in jewelry design, make them a popular choice among consumers and designers alike. Though clear in their purest form, Topaz minerals have an array of captivating color varieties. 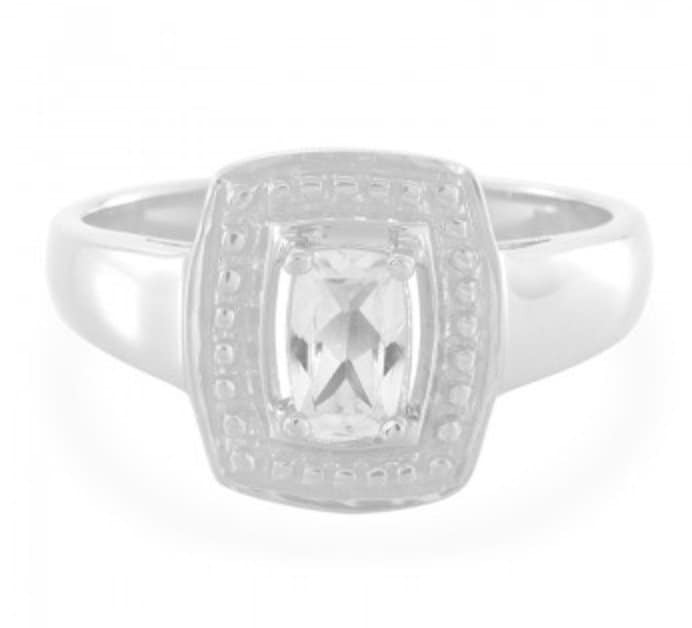 Colorless Topaz, however, is an extremely popular alternative for the traditional diamond due to its significantly lower price tag coupled with its high Mohs Hardness Rating. 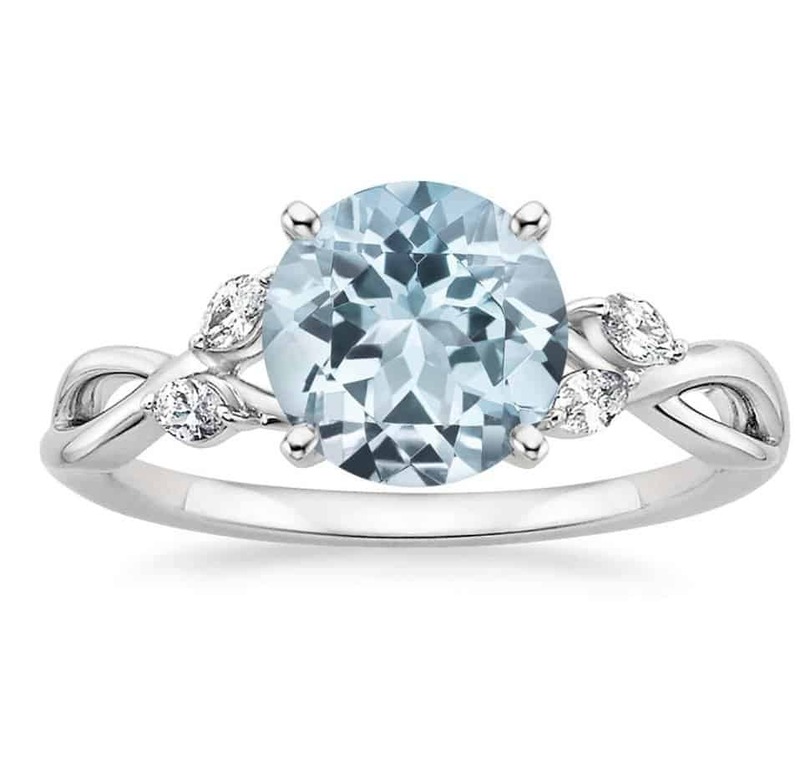 Blue Topaz is one of the most popular blue gemstones on the market due to its bold and bright coloring. 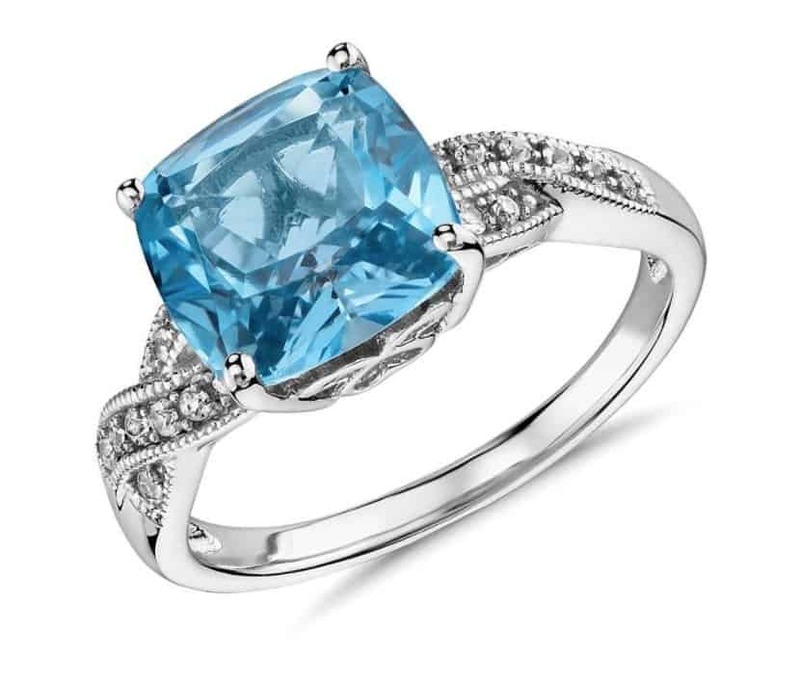 This stone, though, obtains its color through heat treatment and it is important to know that a Topaz mineral with naturally occurring blue colorations is extremely rare. Azotic Topaz is a stunning stone that reflects a rainbow of wonderful and delicate shades. 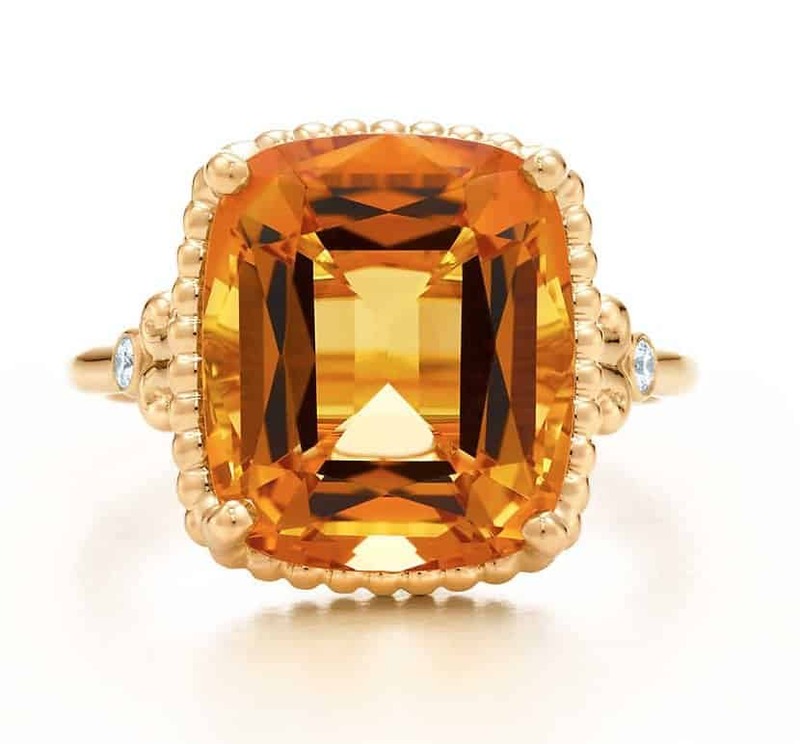 Typically, an Azotic Topaz reflects yellow, orange and pink tints that resemble a sunset. This gorgeous stone is a hard variety of gemstone, though its perfect cleavage makes it easy to crack and chip. Mystic Topaz, like Azotic Topaz, is a colorless gem that reflects a rainbow of stunning shades and patterns. Mystic Topaz carries a variety of nicknames, most fitting of which being “Alaskan Ice” due to its purple, green, and blue light reflections. 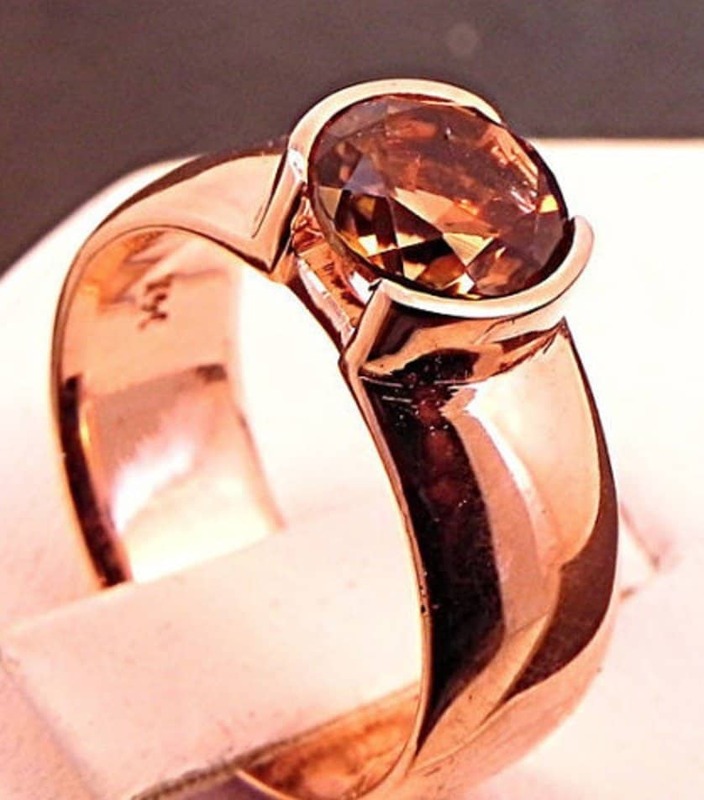 Imperial Topaz is the most popular form of Topaz due to its purity. 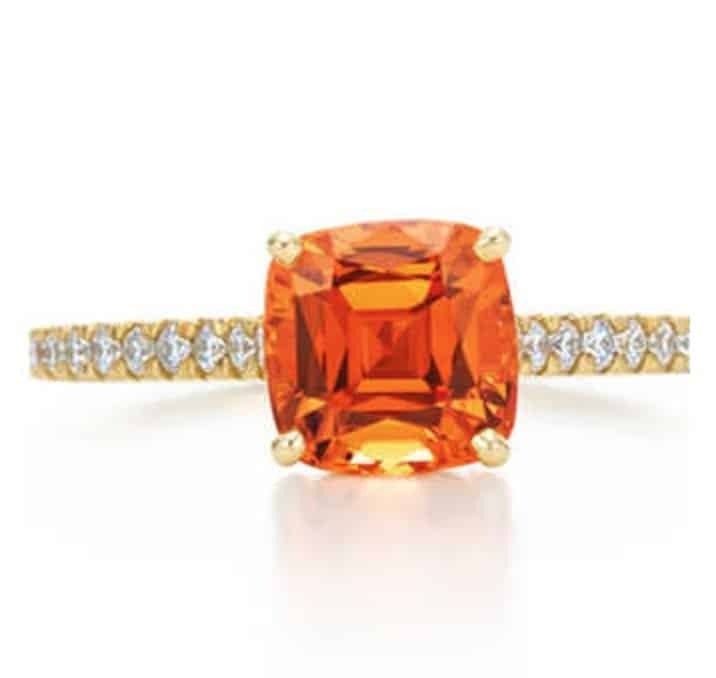 This stunning gem comes in a variety of awe inducing colors, the most popular of which being a subdued yellowish orange that resembled the hue of the setting sun. Tourmaline is a Boron Silicate Compound that bears a Mohs Hardness Rating ranging between 7 and 7.5. This mineral is typically compounded with various other elements, giving it the title of being the mineral with the widest variety of coloring. Green and blue forms of tourmaline are believed to get their hue from being compounded with iron, reds are believed to obtain their shades from being compounded with manganese, and pink and yellow forms of the stone are pigmented through enhancements or natural radiation – it is this wide variety of coloration that makes Tourmaline one of the most popular minerals for gemstone productions. Achroite is a colorless variation of tourmaline. 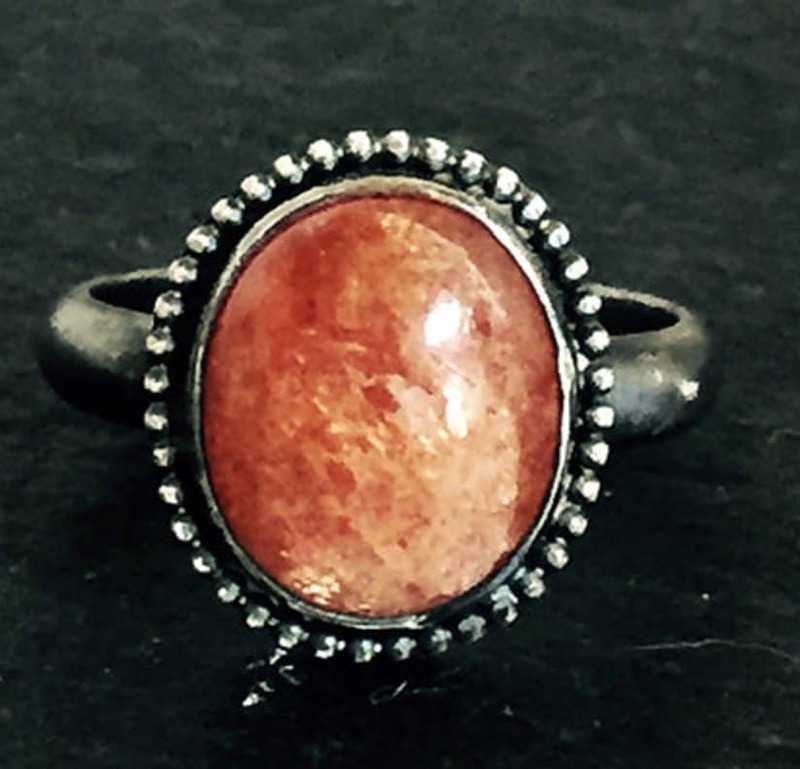 This form of the gem may sometimes have slight inclusions of colors, depending on the presence of other elements. A completely colorless and translucent variety of Achroite will be considered rare and relatively valuable. Achroite is also a less expensive, socially and economically friendly, alternative to diamonds. Bicolor it is not unusual for a tourmaline crystal to form in a combination of colors, depending on the elements present in their formation. 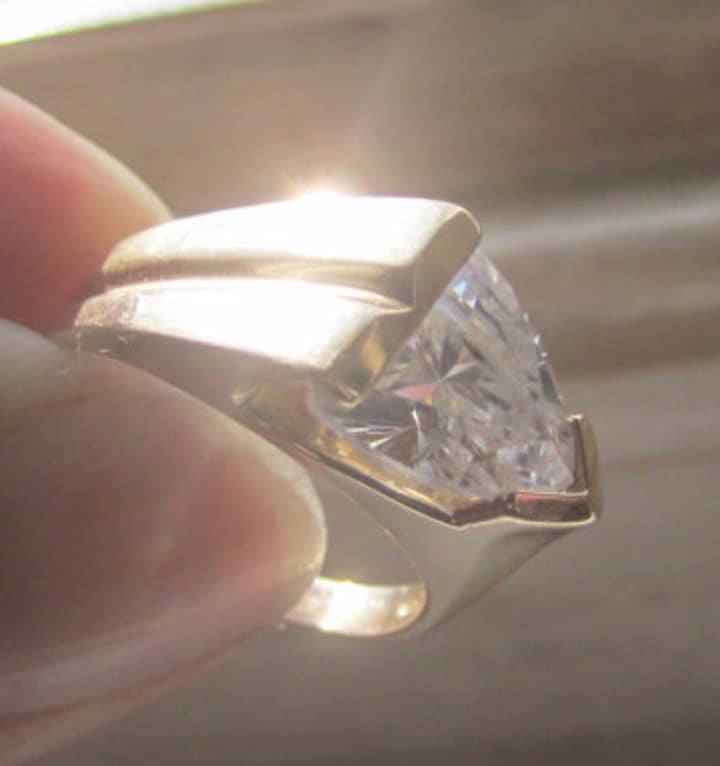 These combinations vary in rarity, popularity and value – it is a common rule of thumb that the more even the distribution of the varying colors (ie: 50/50 instead of 25/75) and the clearer the distinction between them, the more valuable the stone. 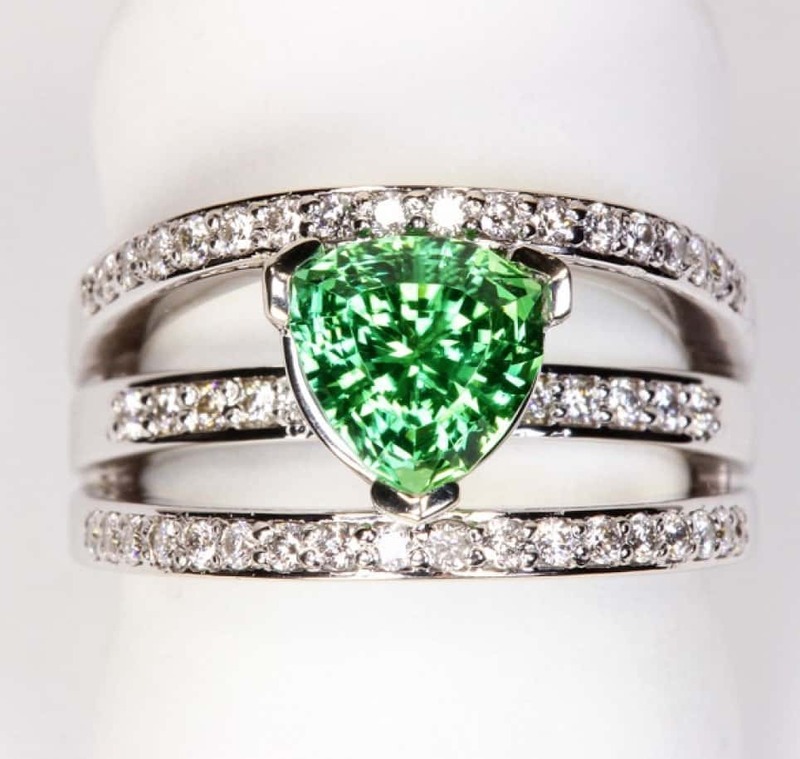 Chrome is a vivacious green variety of tourmaline that obtains its color through the presence of chromium. 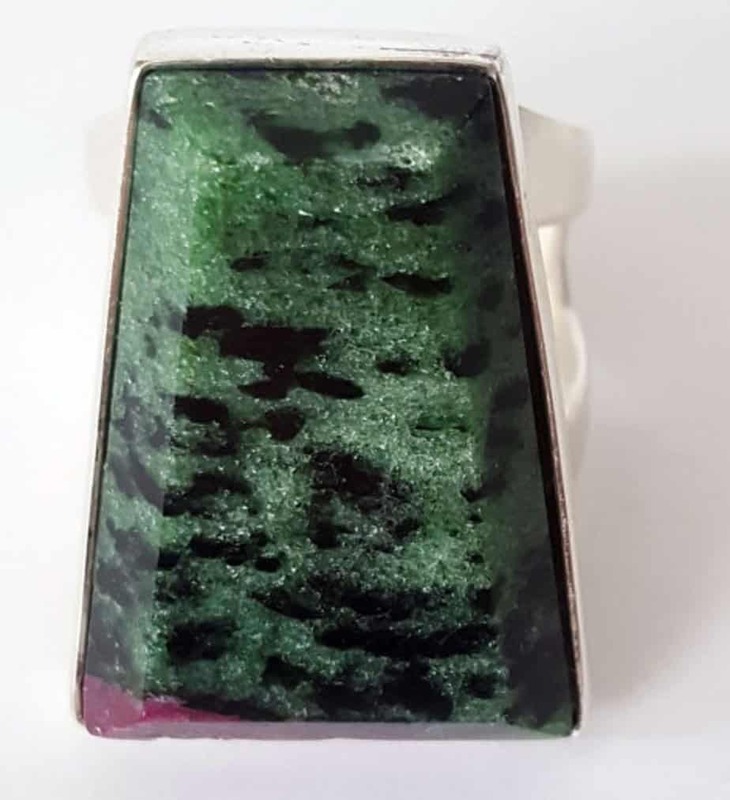 Chrome tourmaline is only found in east Africa and the sizes in which it is found are typically small – therefore, an evenly colored large cut of this gemstone will be hard to find and relatively expensive. 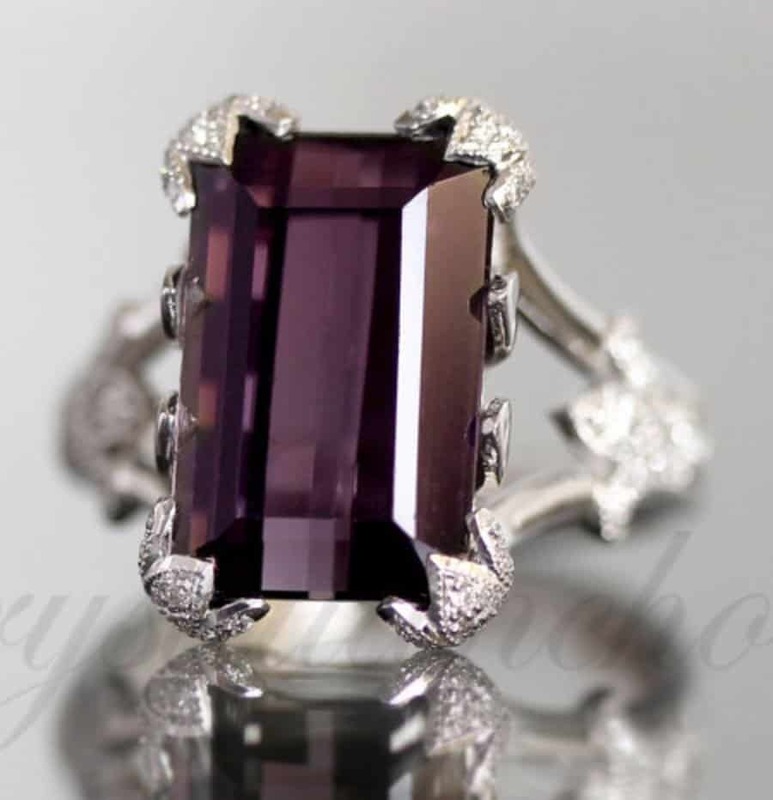 Dravite is also known as brown tourmaline, though this name can be misleading. Through Dravite can be found in varying shades of brown, this form of tourmaline also displays deep orange hues reminiscent of autumn. Indicolite is a blue variety of tourmaline, whose coloring ranges from light to dark hues of the color. 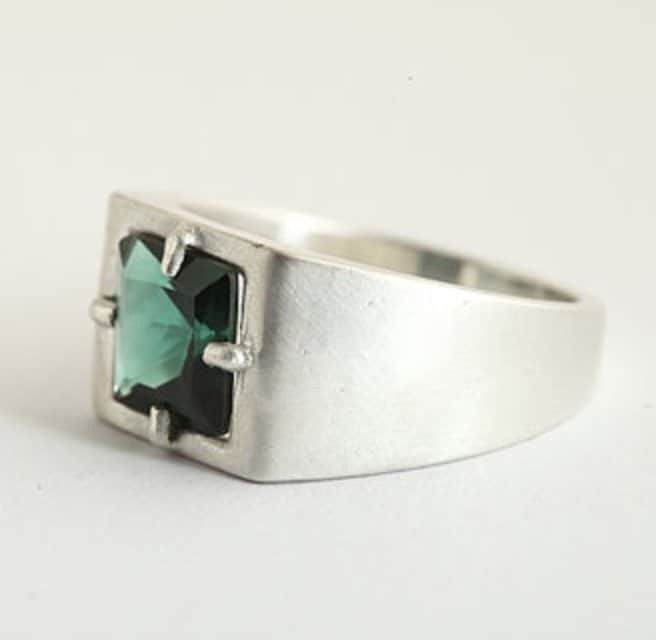 Indicolite often has green undertones, creating a shade reminiscent of Aqua. Though this undertone can be removed through irradiation of the stone, this shade is oftentimes so highly desired that it is left as it is. 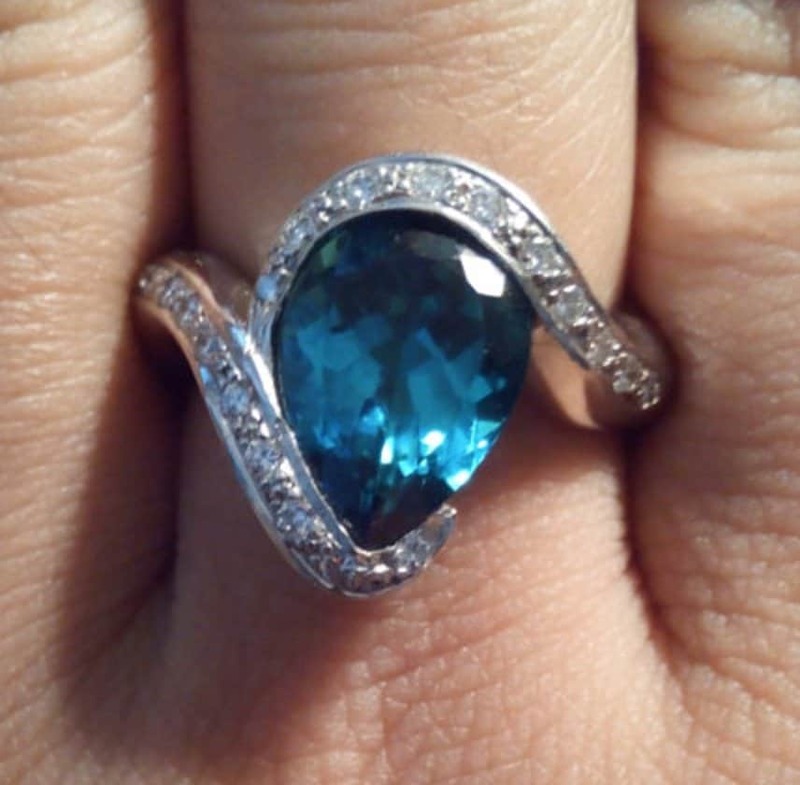 Paraiba is another form of blue tourmaline. 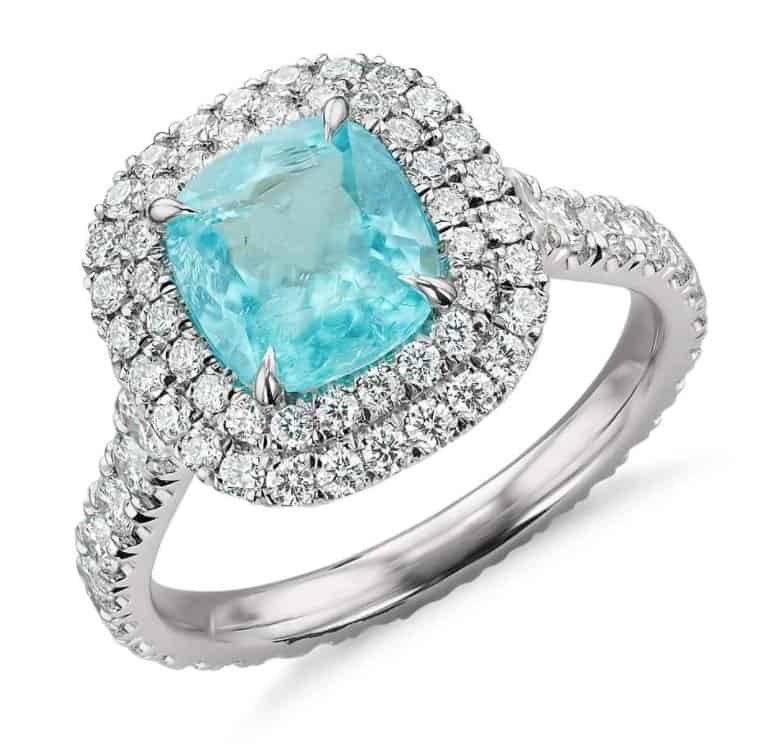 Unlike Indicolite, Paraiba does not possess green undertones. This tourmaline gemstone is a light shade of blue that is comparable to a clear blue sky, though at times it could have richer tints that are more comparable to crystal clears waters. 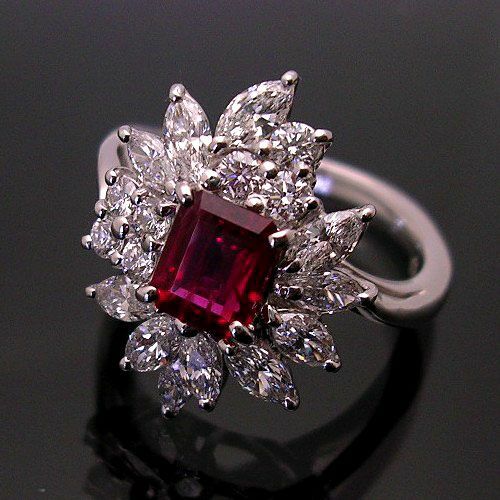 Rubellite is a red variety of tourmaline and one of the most popular gemstone types. 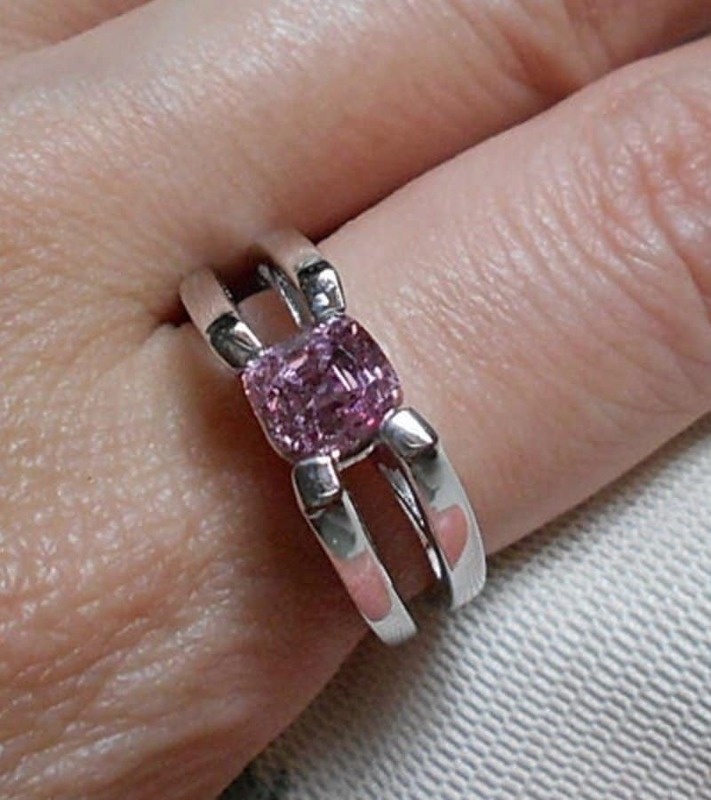 The ideal coloring of this form of Tourmaline is highly debated amongst collectors and gemologists – while some find the reddish-purple variety to be ideal, others find desirability in a peach tinted form of Rubellite. Regardless of the “perfect color”, this stone has the versatility to fit the liking of even the pickiest bride or groom to be. Schorl is the most common form of Tourmaline, though its crystals aren’t. Schorl forms aesthetically pleasing black crystals which, as a result of their high luster, make them rare and desirable by collectors! 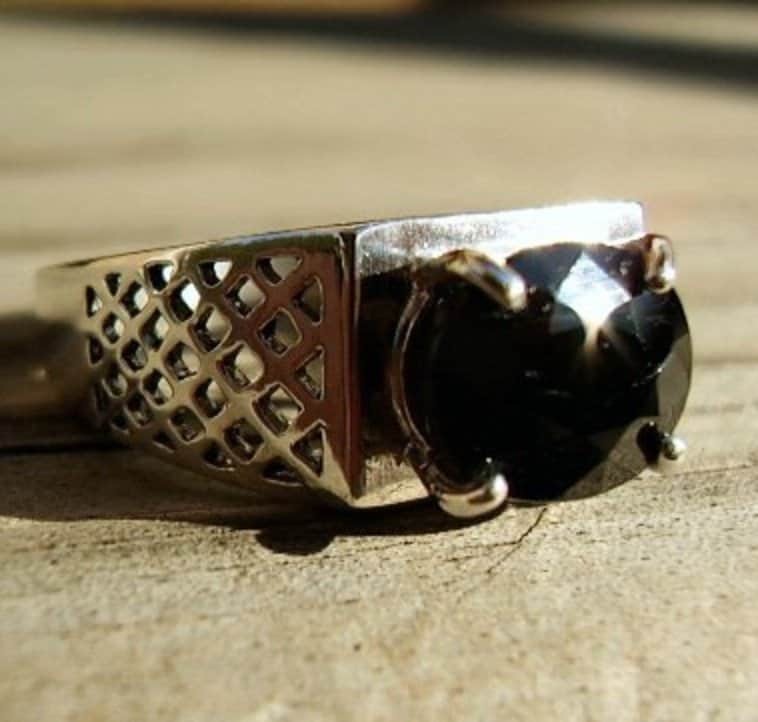 Although Schorl *can* make for a beautiful addition to any wedding or engagement band, in its most common form, this stone is dull and brittle, making it an unlikely candidate for a majority of wedding or engagement rings. Siberite is one of our favorite forms of Tourmaline. This form of tourmaline, in non-collector quality, is surprisingly affordable, in large to the fact that it isn’t well known, while still displaying radiating purple or reddish-purple colorings that stack up impressively against much more expensive purple gemstones. Watermelon tourmaline is a bi-color form of tourmaline that combines reddish pink shades of the stone with the green ones, creating a color scheme that resembles a watermelon. 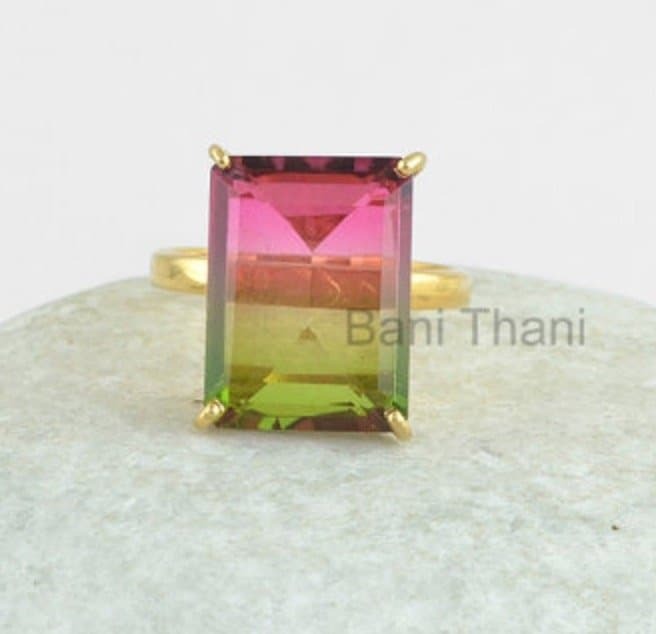 Watermelon Tourmaline’s value varies, but is in part determined by the distribution of the two colors (50% green and 50% pink) as well as a clear line distinguishing the two colors from one another. Zircon, as the name suggests, is a zirconium silicate. These mineral rate at 7.5 on the Mohs Hardness Scale, making them a moderately hard minerals. Zircon gemstones range extensively in color variety, though the value of these gemstones isn’t as dependent on their coloring as it is on their quality of refraction and fire. 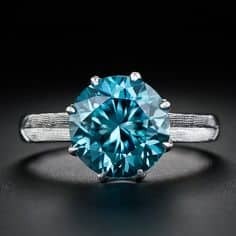 Though the name Zircon suggests a familiarity between these stones and the diamond synthetic Cubic Zirconium, there is no relation between the two. 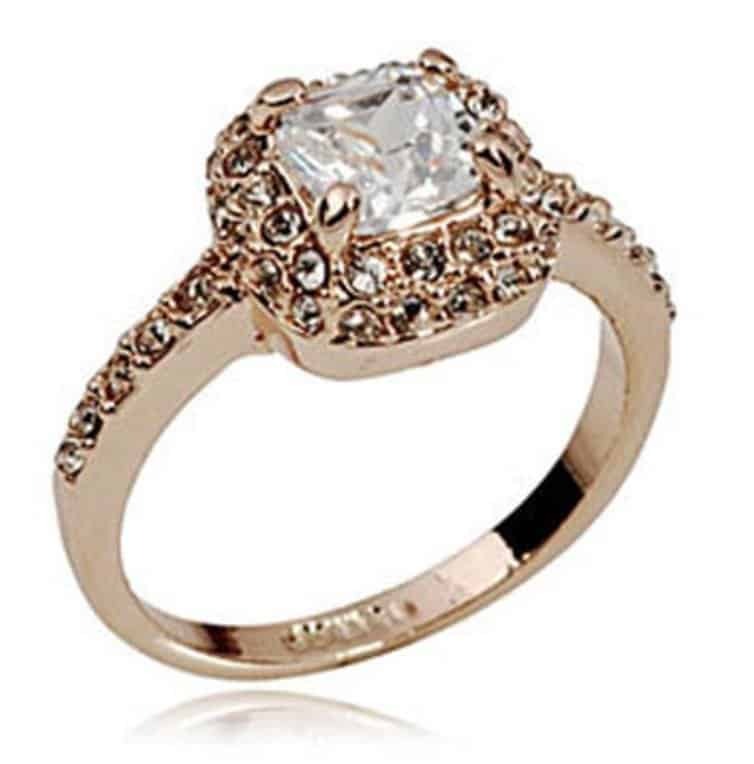 Cubic Zirconium is an artificial diamond alternative – Zircon, on the other hand, is all natural and very rarely has the coloring necessary to resemble a diamond. Low Zircon is the name given to minerals within this group that have undergone high radioactive damage. 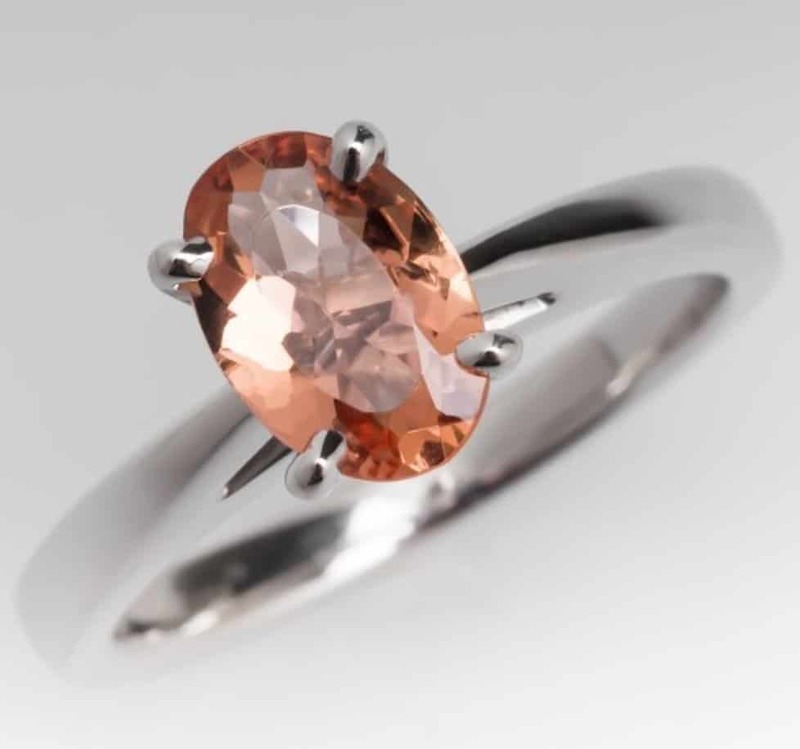 Low Zircon’s are prone to having little to not crystal structure, making them unusable for jewelry. Blue Zircon, also called Starlight Zircon, is a magnificent blue gemstone that holds the highest level of refractivity amongst the blue gemstones. Blue Zircon, the most popular of the Zircon family, is actually a brown zircon that has been heat treated to its stunning hue. Green Zircon, though a pretty and earthy shade of brownish green, is a low quality zircon whose coloring is a result of radiation damage. Though aesthetically appealing, this stone is rarely fit for jewelry production due to its internal damage. 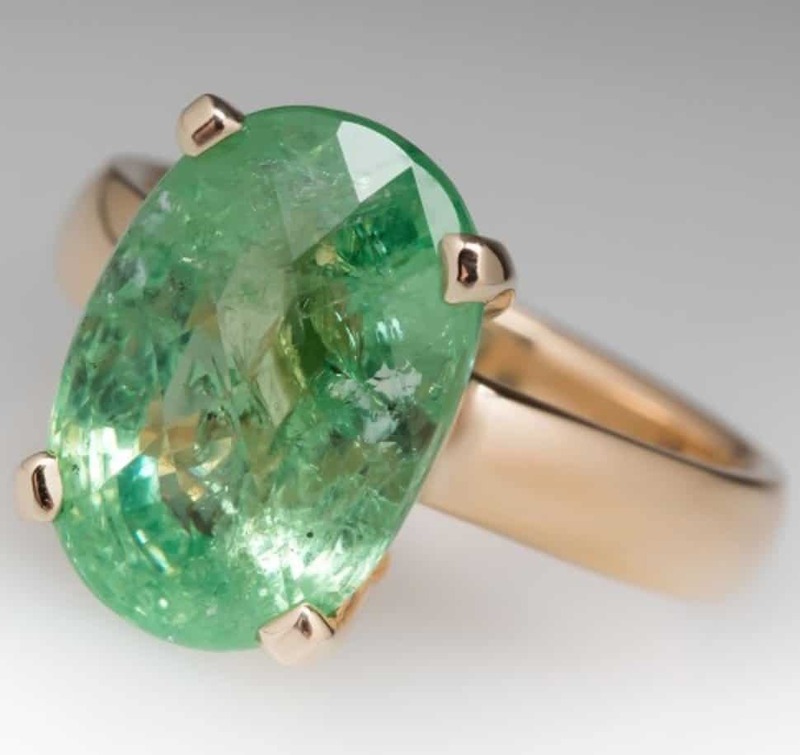 Good quality Green Zircon is both extremely rare and extremely expensive. Golden Zircon is a highly used form of this mineral due to its minimal to nonexistent radioactive damage. As might be speculated, this form of zircon displays radiant shades of dark, almost brown, yellow and gold. Hyacinth used to be a name attributed to Zircon gemstones that varied in color from yellow to gold. This name is no longer used in relation to Zircon minerals of any sort. Jacinth, like Hyacinth, is an outdated name that is no longer used in reference to Zircon minerals. 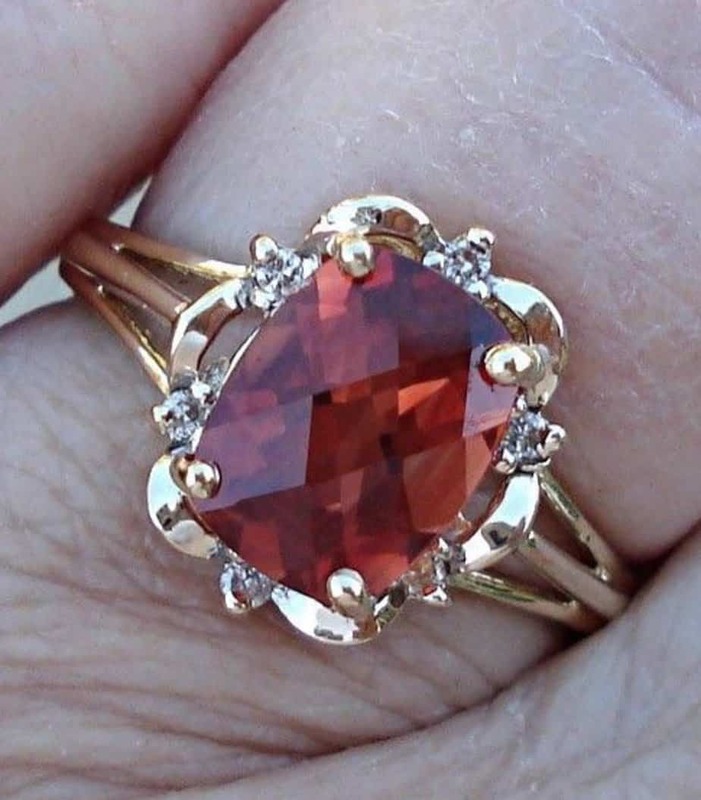 Jacinth is the name that was once used to describe reddish brown zircon gemstones. Zoisite is a Calcium Aluminum Hydroxy mineral that rates between a 6 and 7 on the Mohs Hardness Rating Scale. Zoisite comes in a wide range of colors, but unfortunately its low hardness rating makes it less appealing to collectors and consumers than many of its equally appealing gemstone competitors. Zoisite is a great gemstone choice for a bride or groom looking for a gemstone that, though it may require some additional TLC, is fairly priced. Anyolite is less a crystal and more an opaque rock. This lustrous rock, though, is absolutely stunning – oftentimes black with speckles of green and purple coloring reminiscent of something from the prehistoric times! 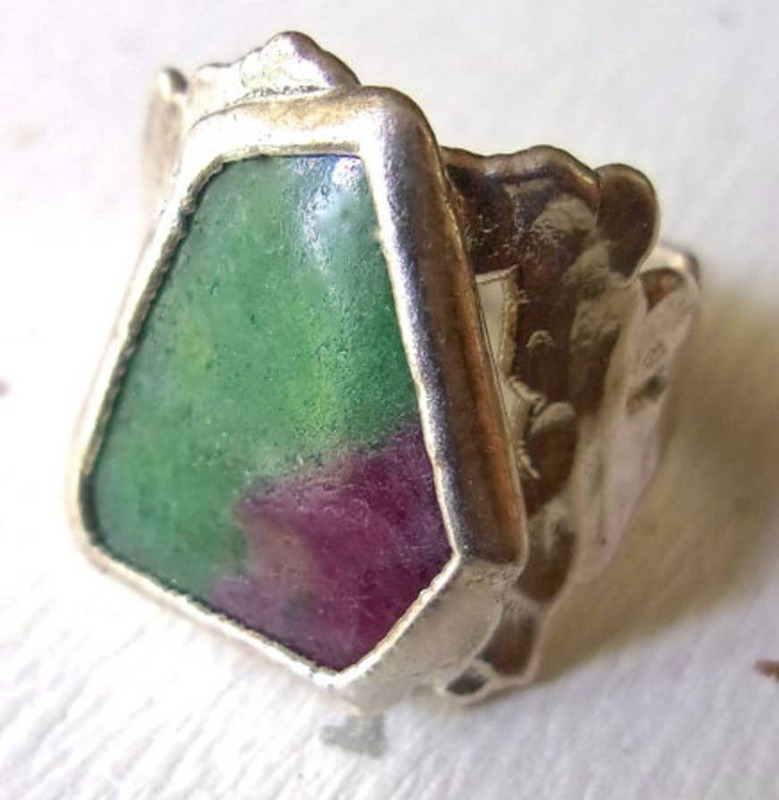 Ruby Zosite is a type of Anyolite, composed of both Ruby and Zoisite. 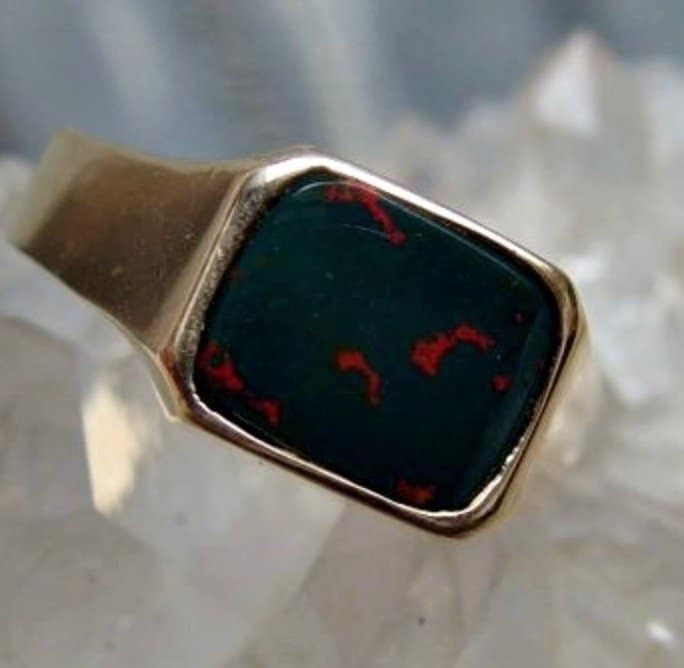 This opaque stone typically has a green base and is mottled in ruby red and black. 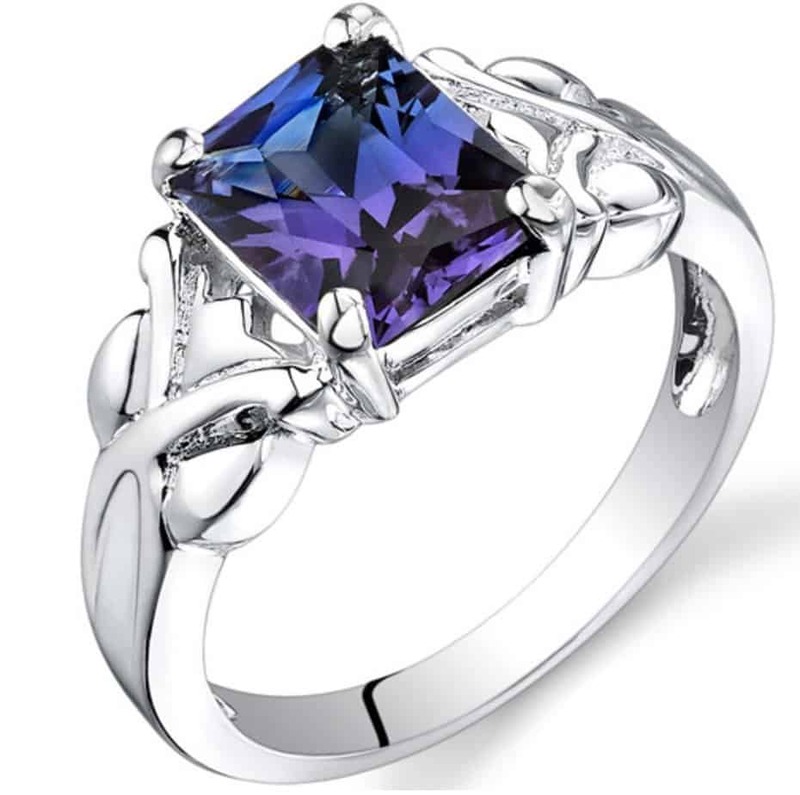 Tanzanite is the most popular form of Zoisite. 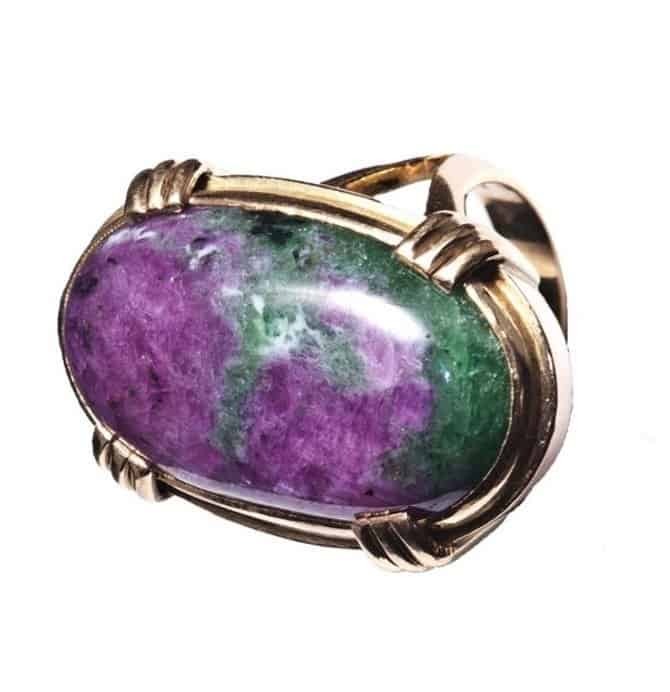 This purplish blue form of Zoisite is the most widely accepted gemstone of the mineral group, and is admired by jewelers and consumers alike. 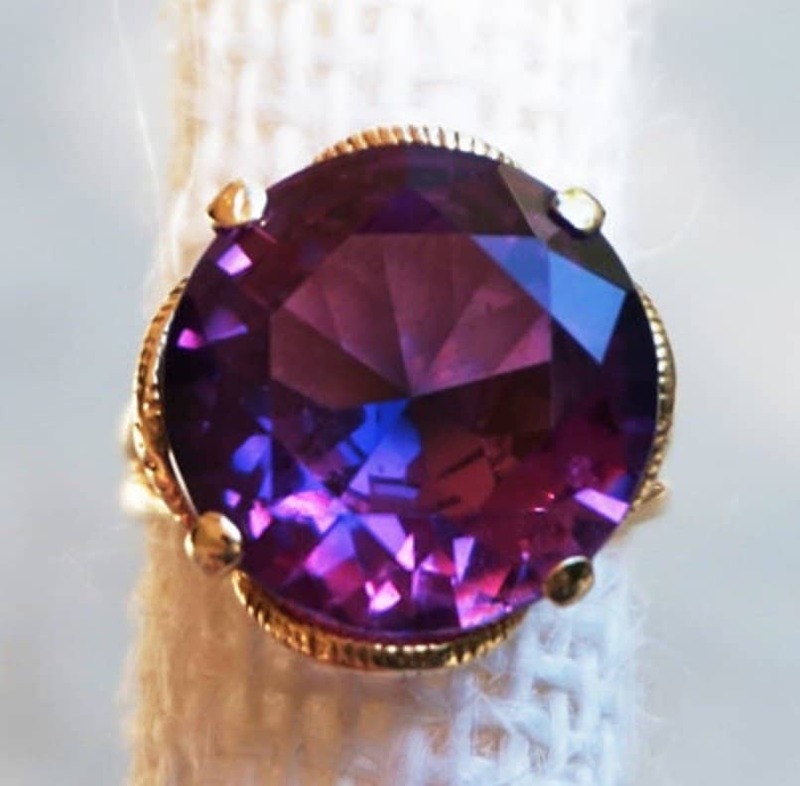 Tanzanite is pleochroic, meaning that although its primary color is a rich velvet, when viewed from different angles it displays three equally stunning shades – purple, blue and red. Thulite is a translucent form of Zoisite. Thulite is typically a salmon-like hue, obtaining its coloring from the presence of manganite. 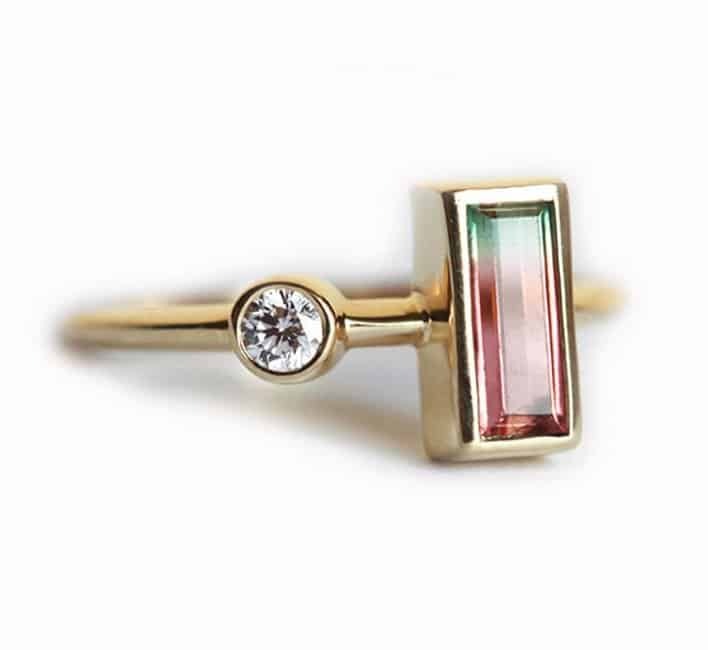 Though it may be lengthy, our list is not inclusive of all gemstones that are worthy of adding to your engagement or wedding band – rather, it is only inclusive of those that fall into easy to distinguish groups while having had gained enough repertoire amongst designers and consumers to be a popular staple in the wedding and engagement ring practice. If you have a gemstones you’d like to know more about, or one that you’d like to tell us about, leave us a comment in the section below!